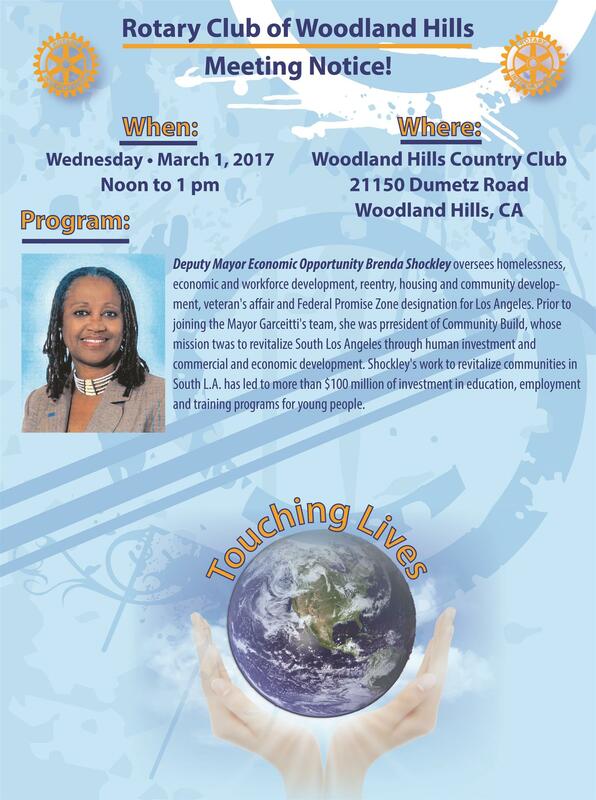 ☛ No Noon Meeting ☚ Good 'ol Southern hospitality at Lucille's Smokehouse BBQ! 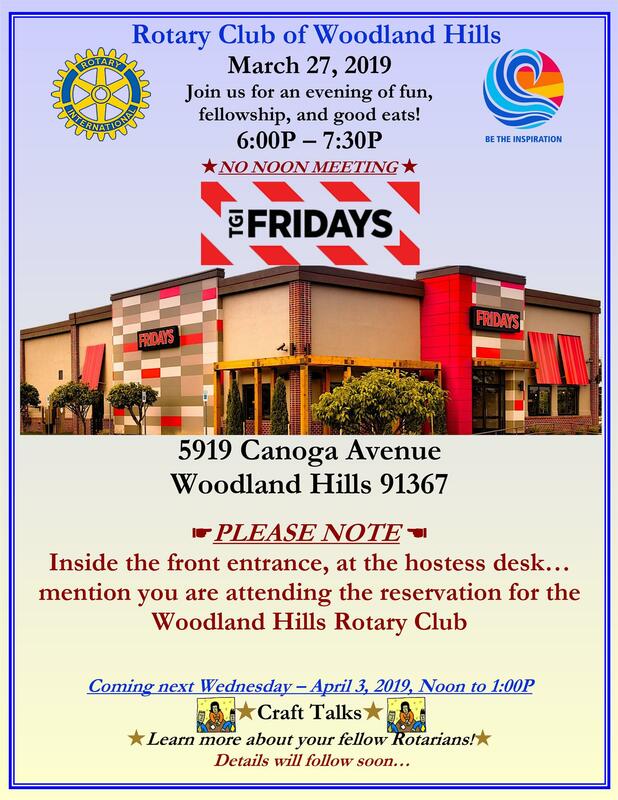 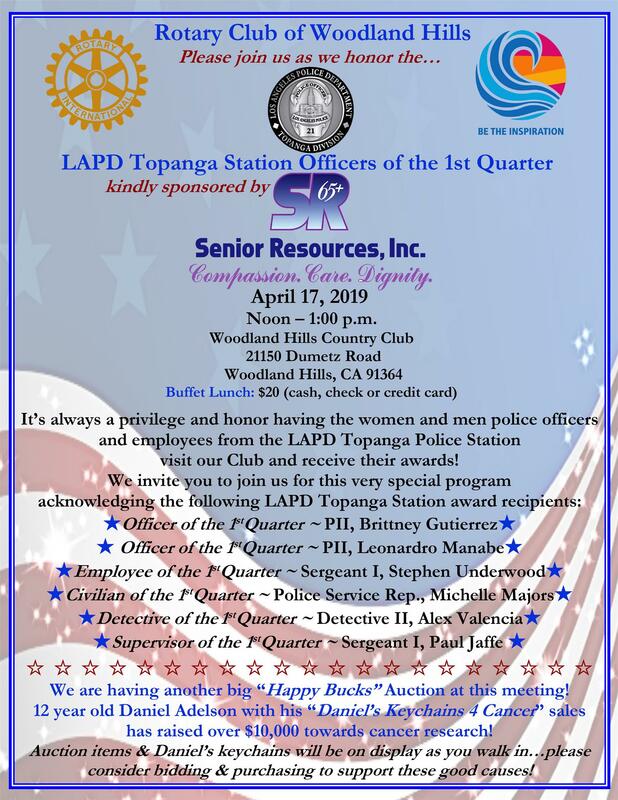 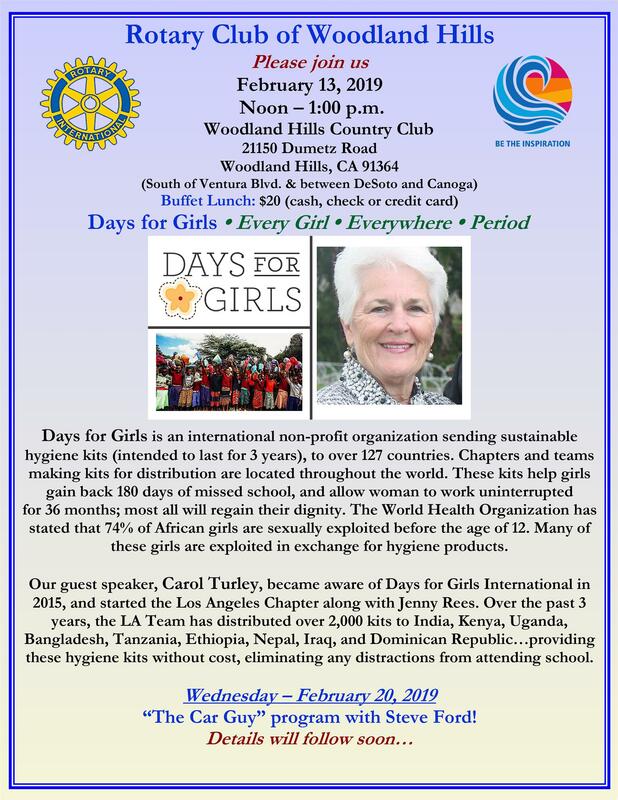 March 27, 2019 ☛ No Noon Meeting ☚ Join us at TGIFridays! 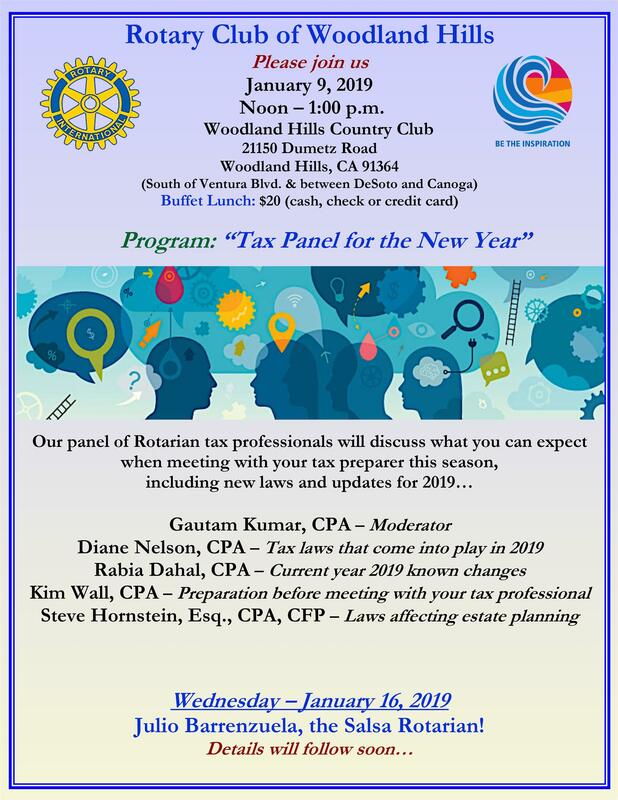 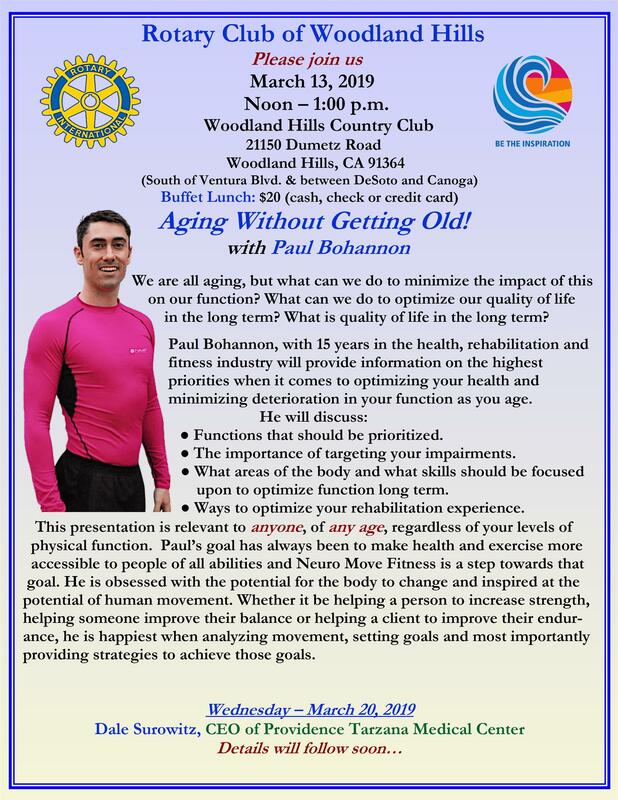 February 27, 2019 ☛ No Noon Meeting ☚ Join us at the Cheesecake Factory! 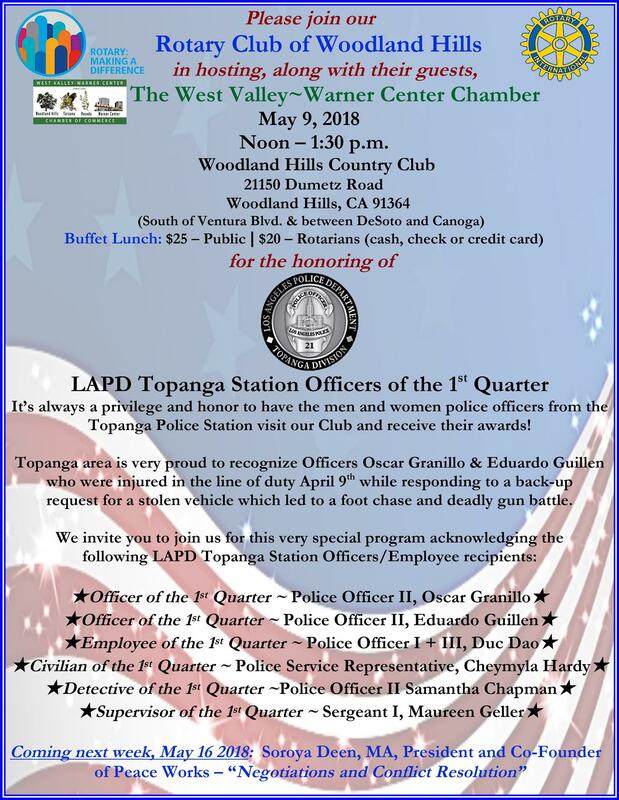 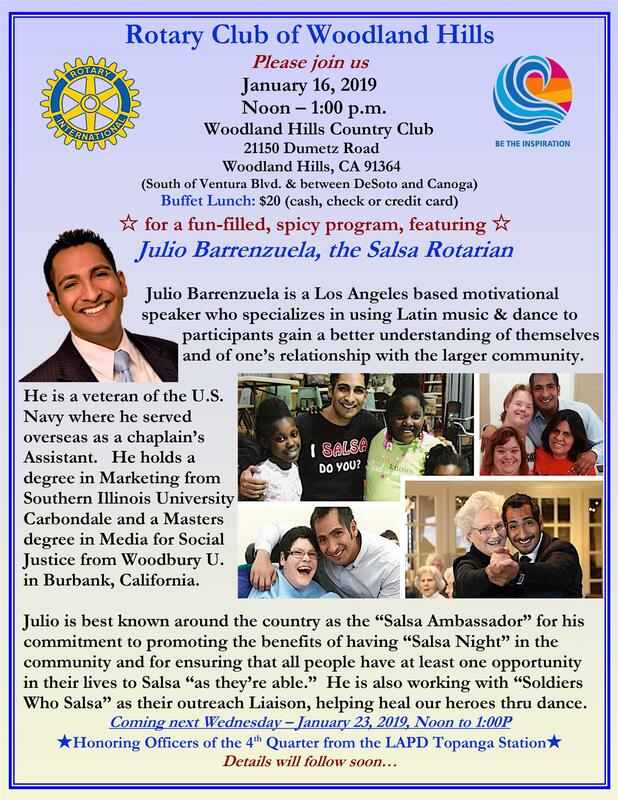 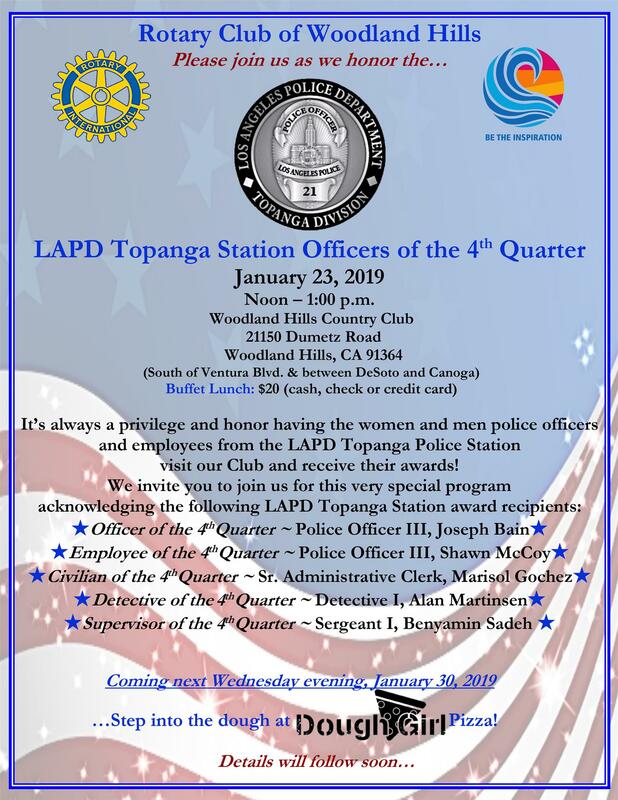 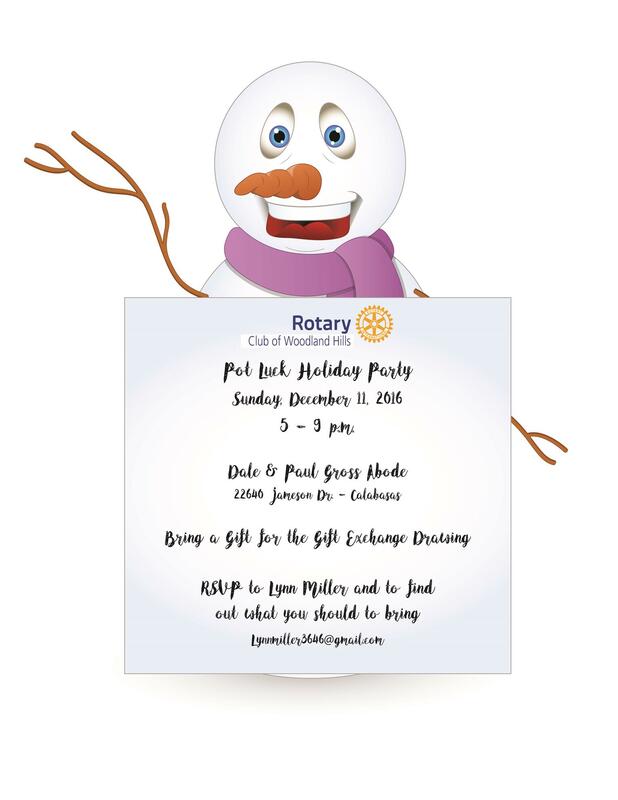 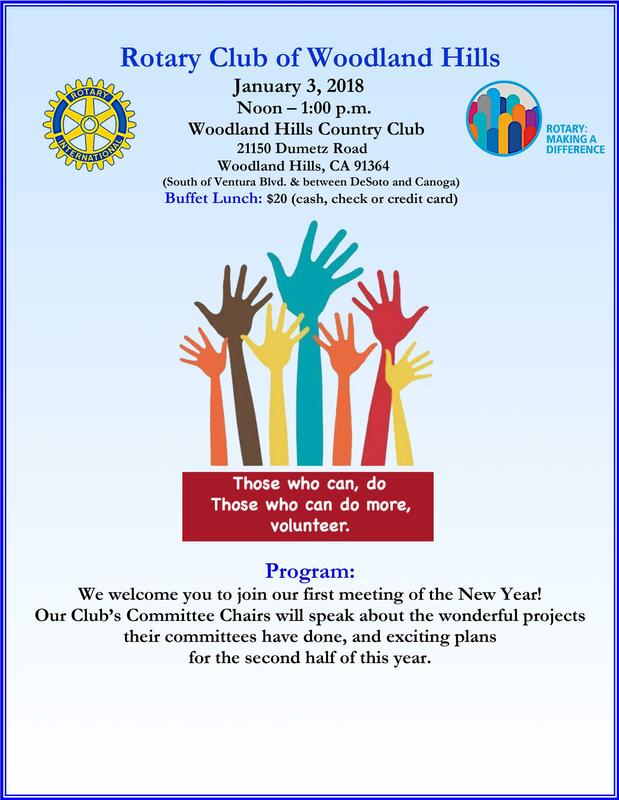 December 19, 2018 ☆ No Noon Meeting ☆ Join us for an evening of fun, good eats and dancing! 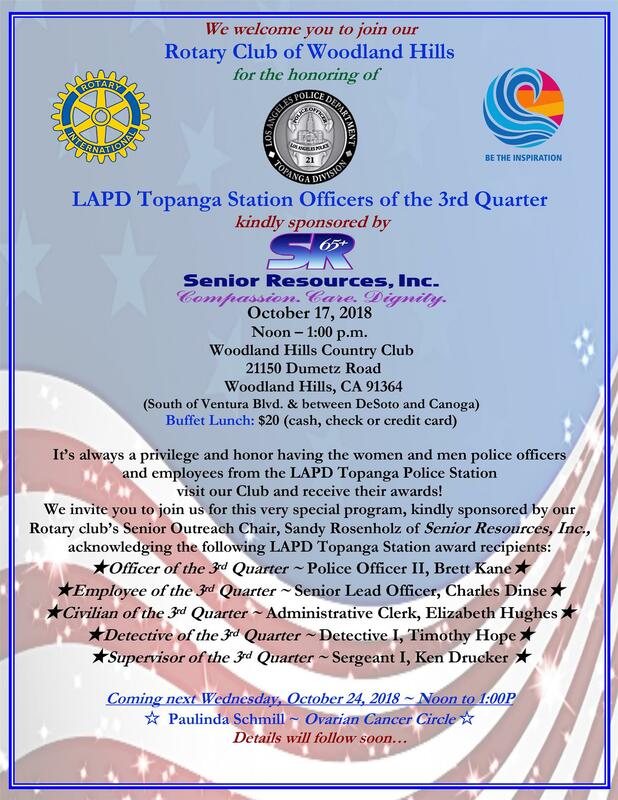 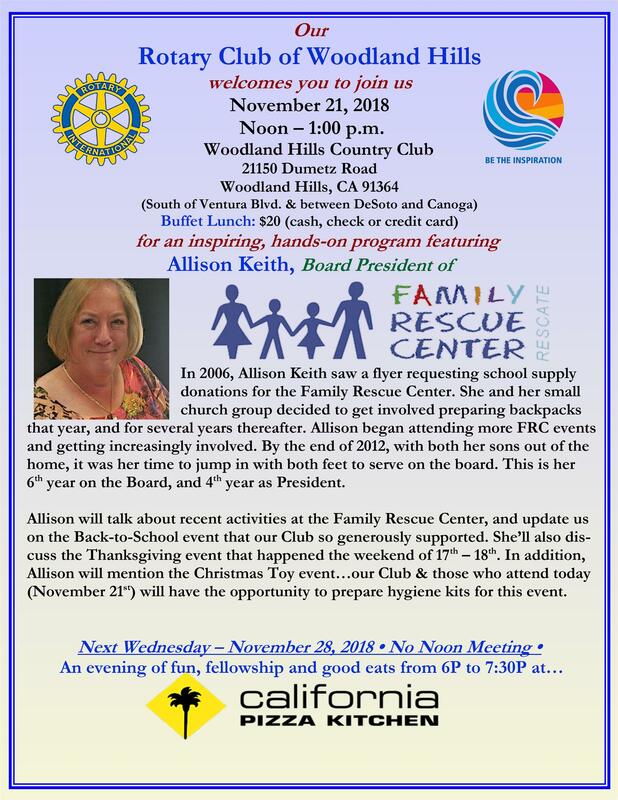 November 28, 2018 • No Noon Meeting • Evening of fun, fellowship & creative dining with a California Vibe! 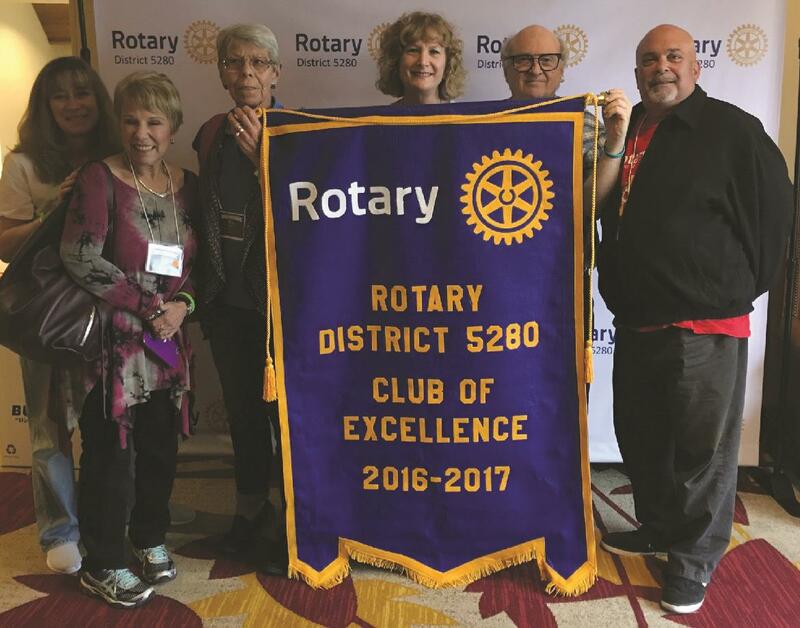 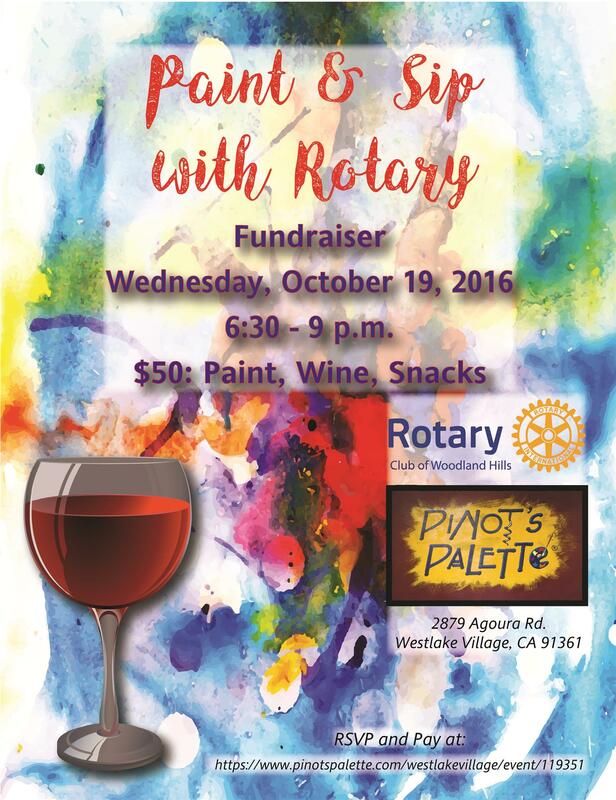 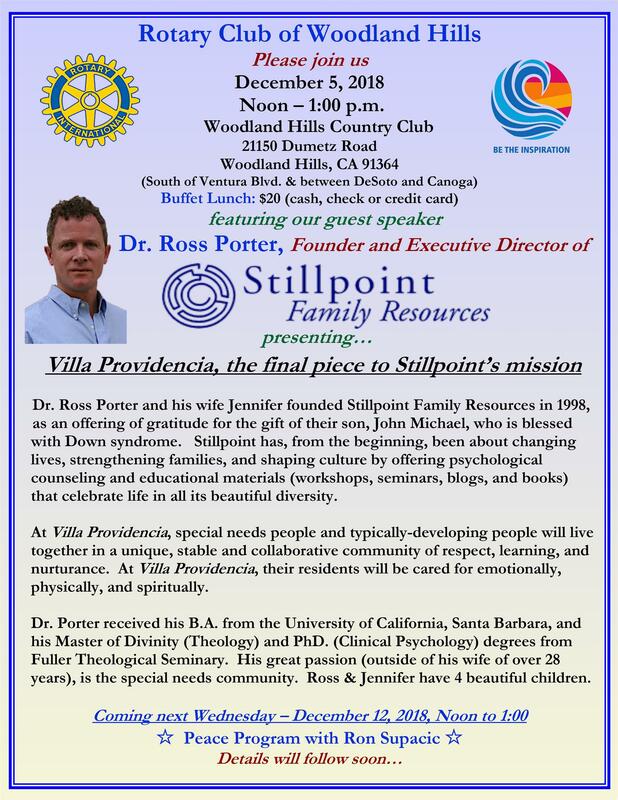 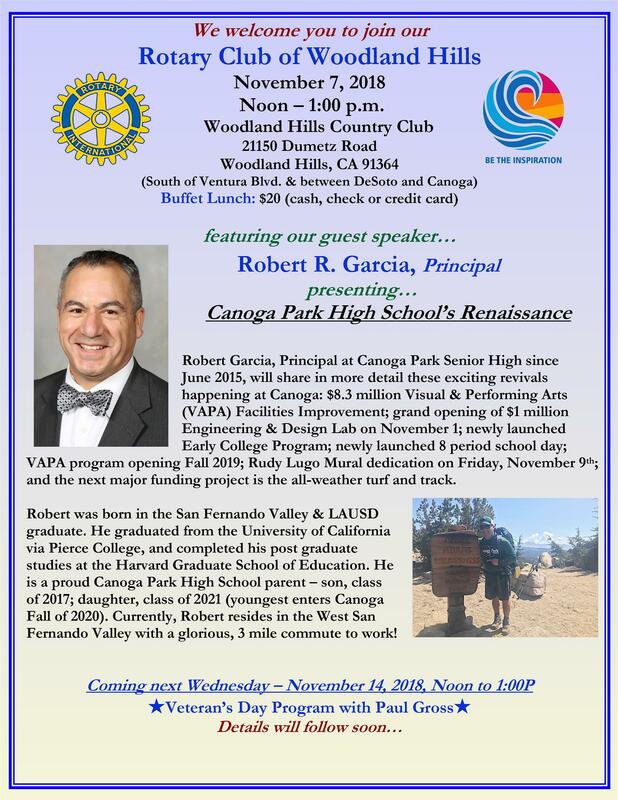 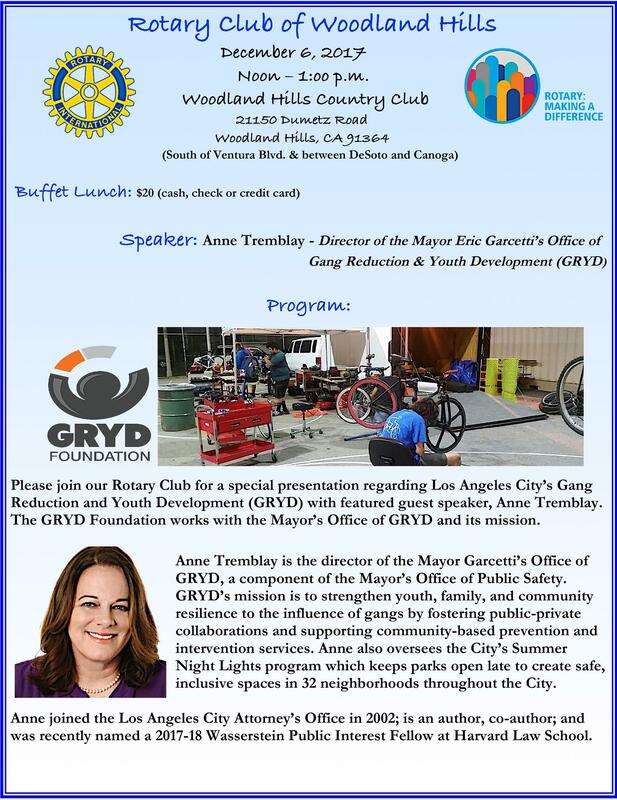 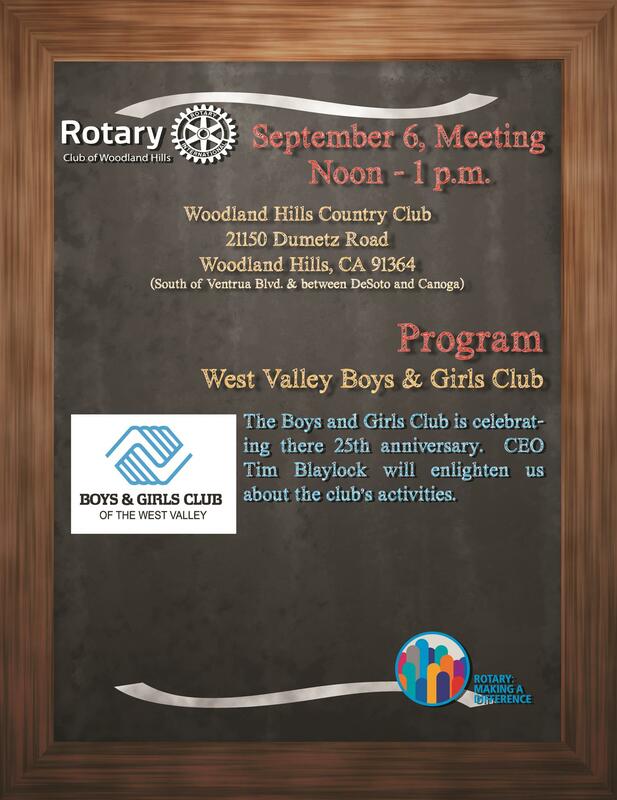 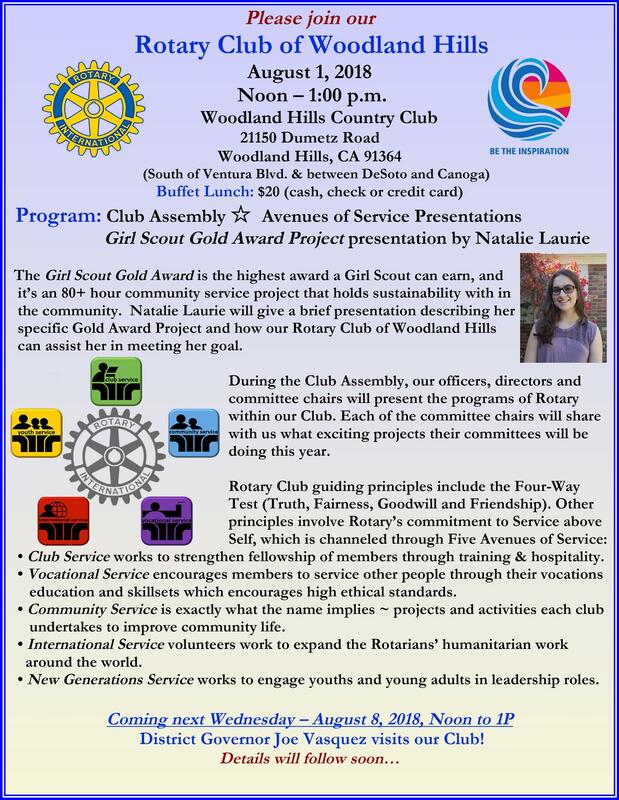 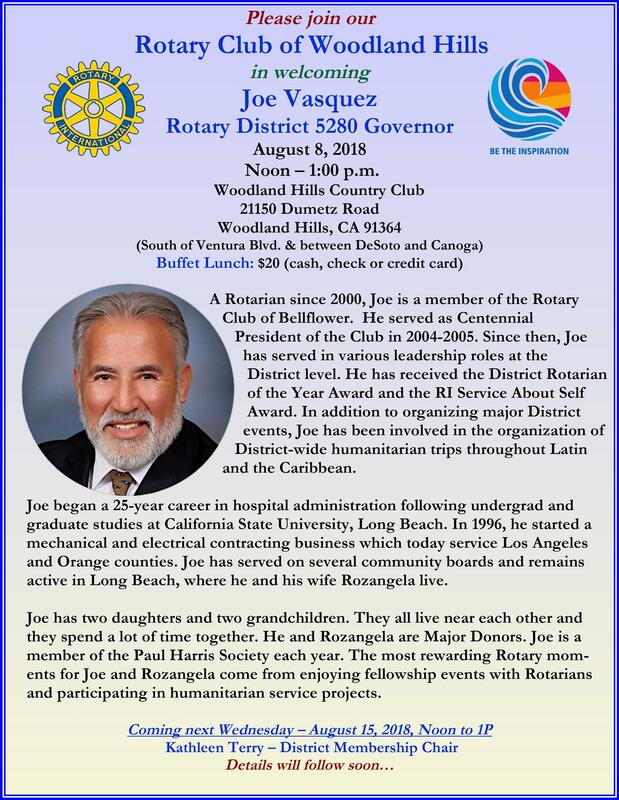 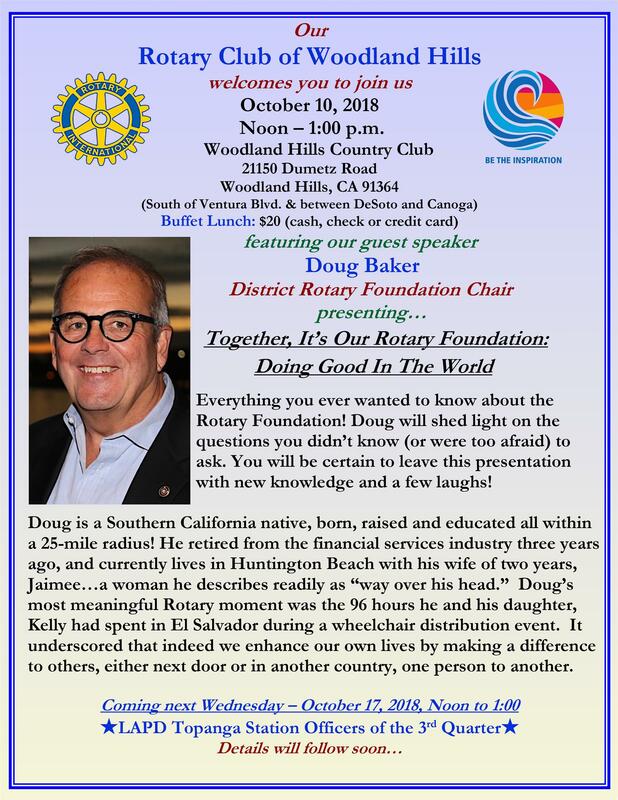 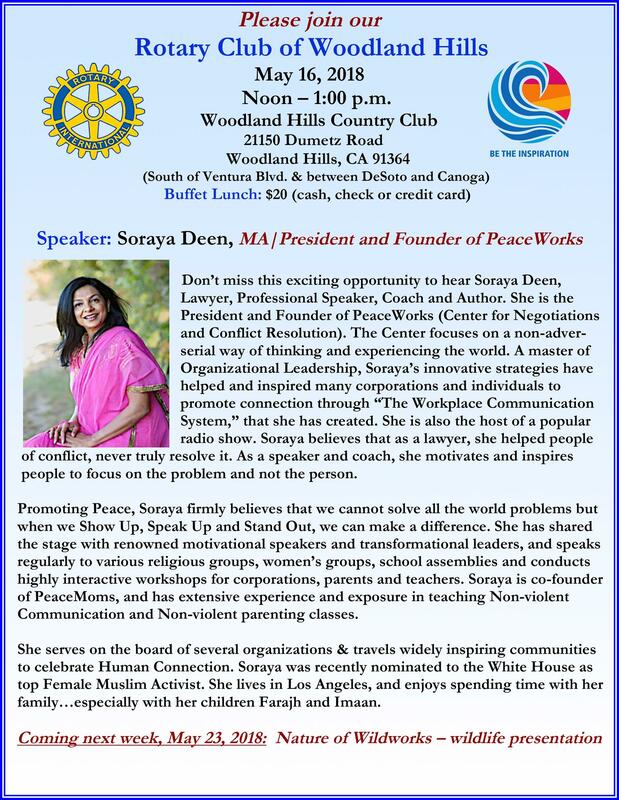 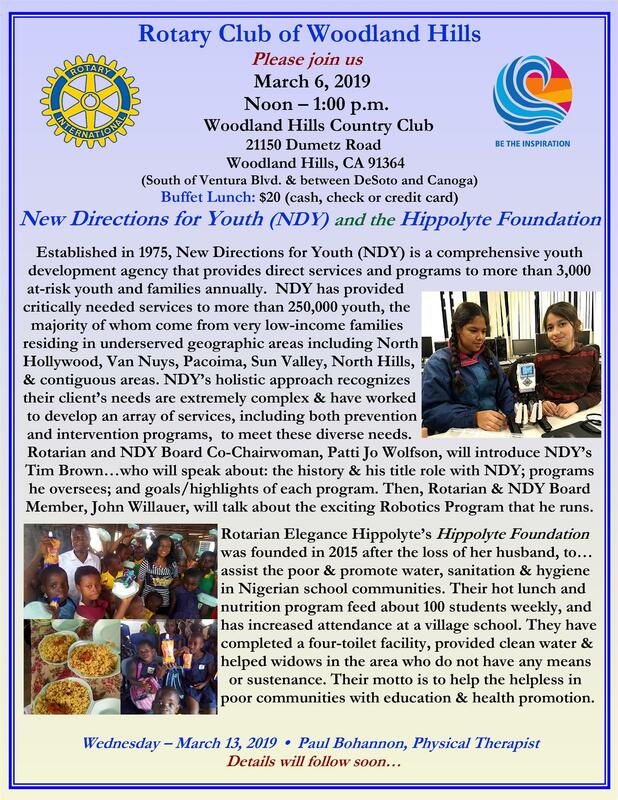 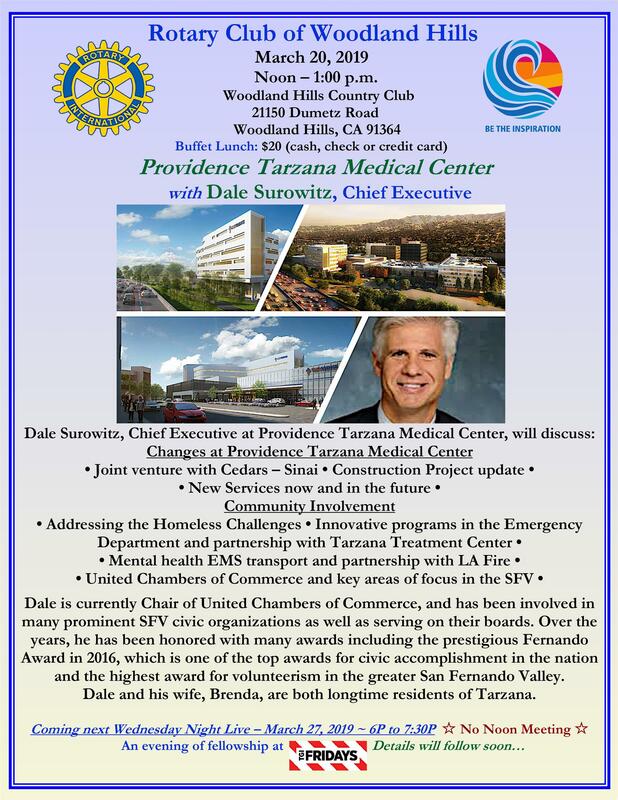 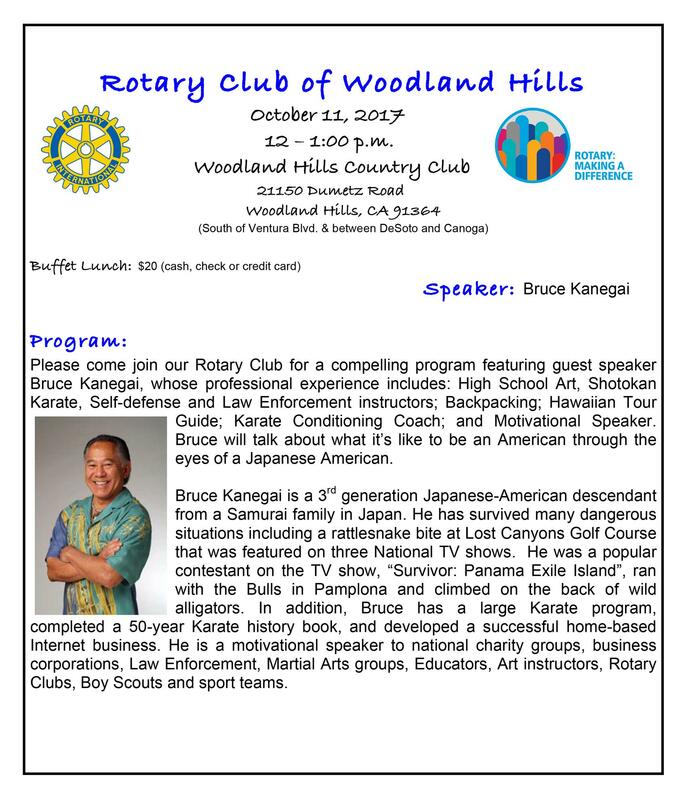 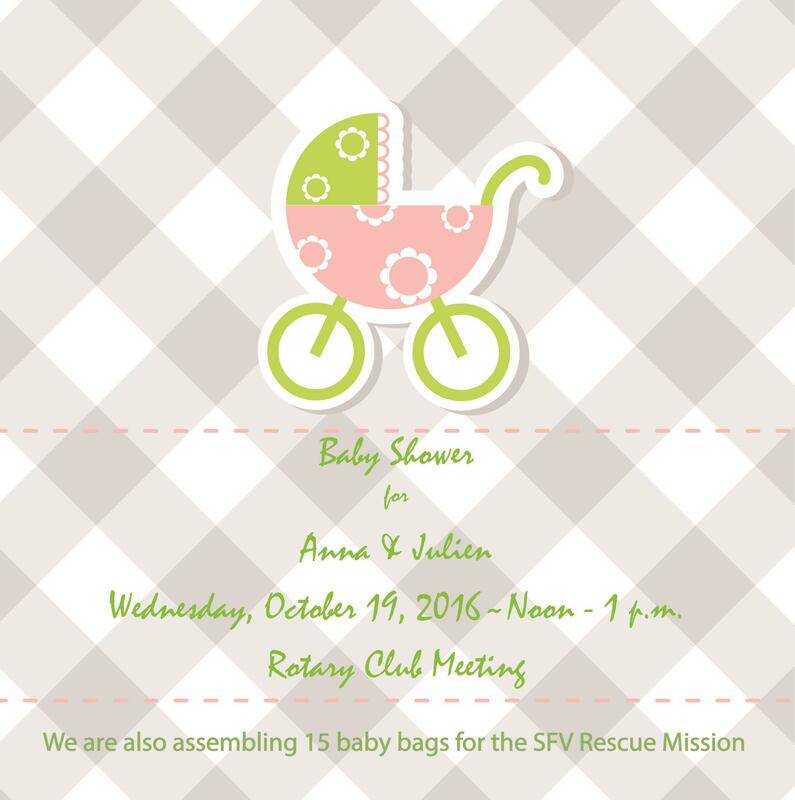 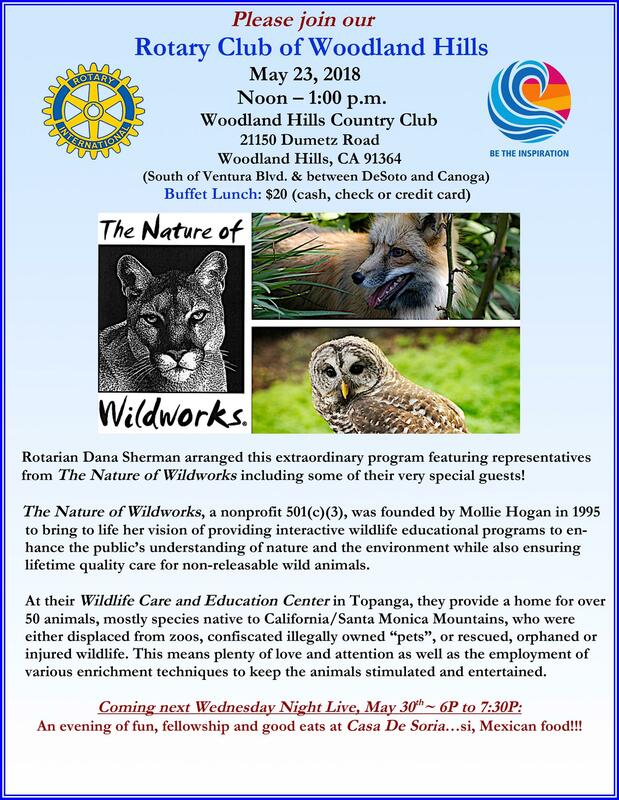 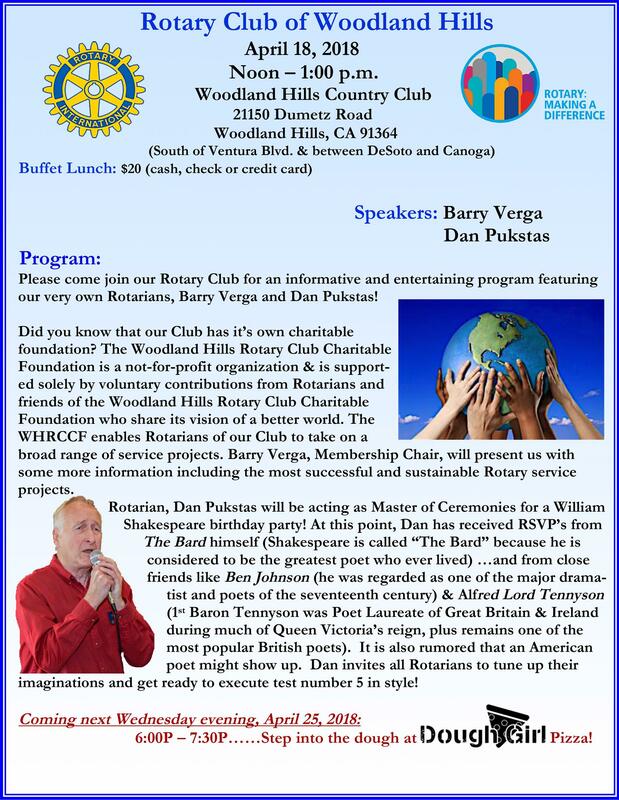 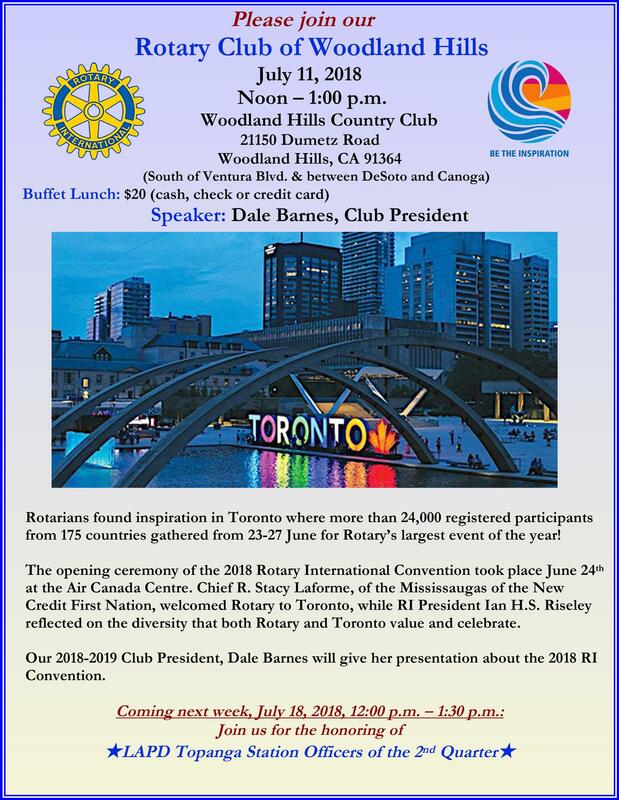 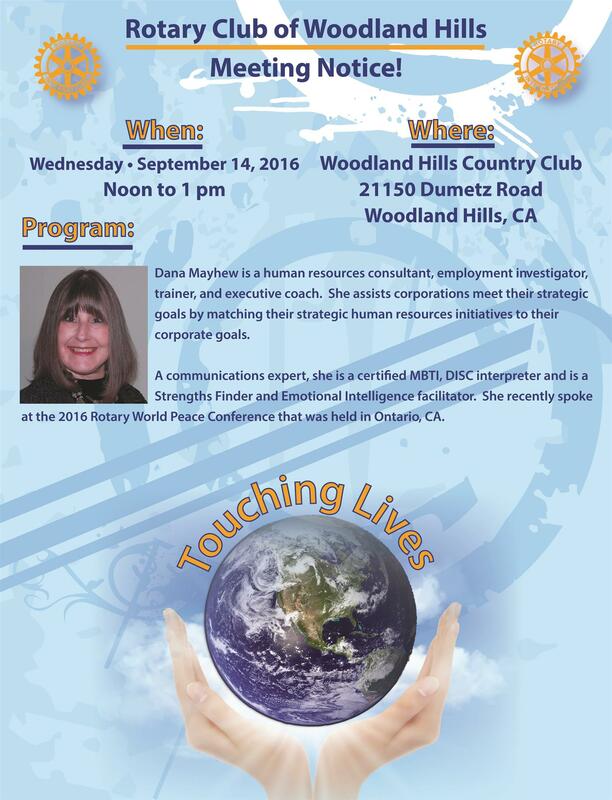 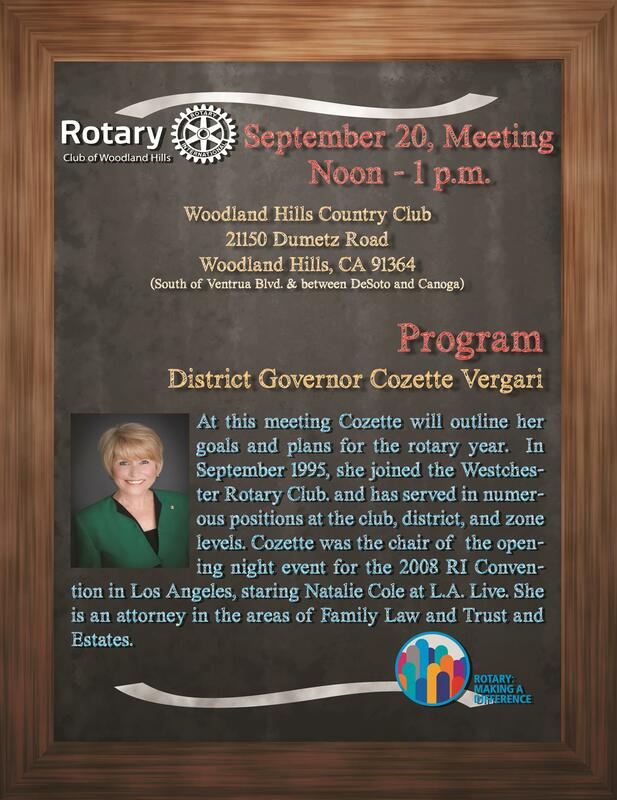 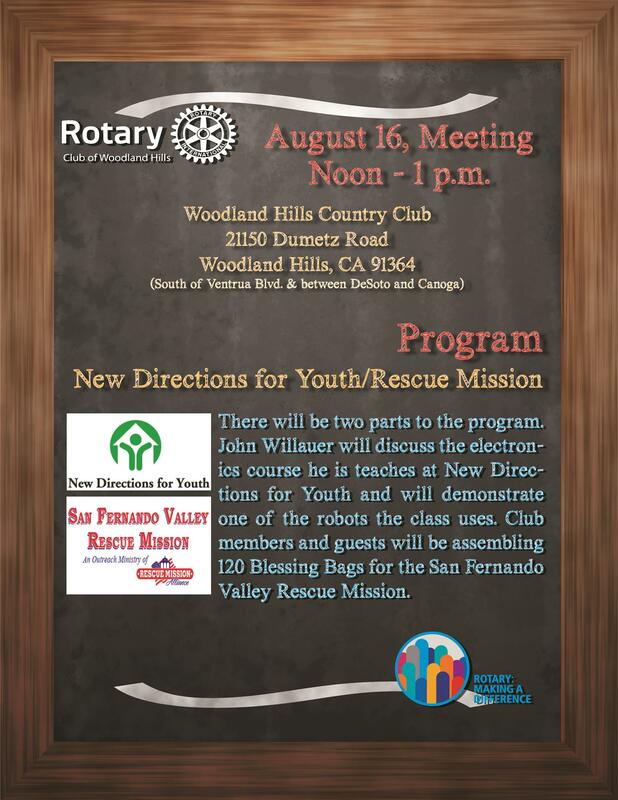 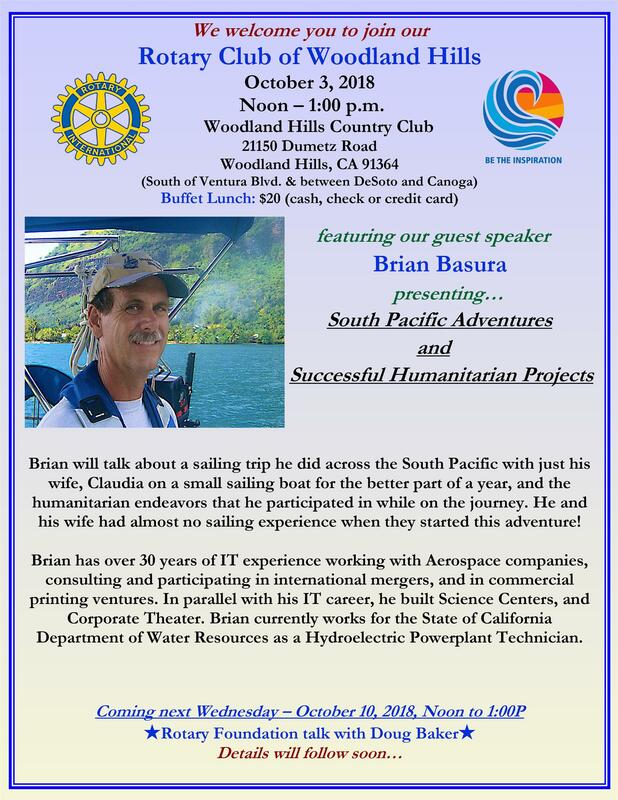 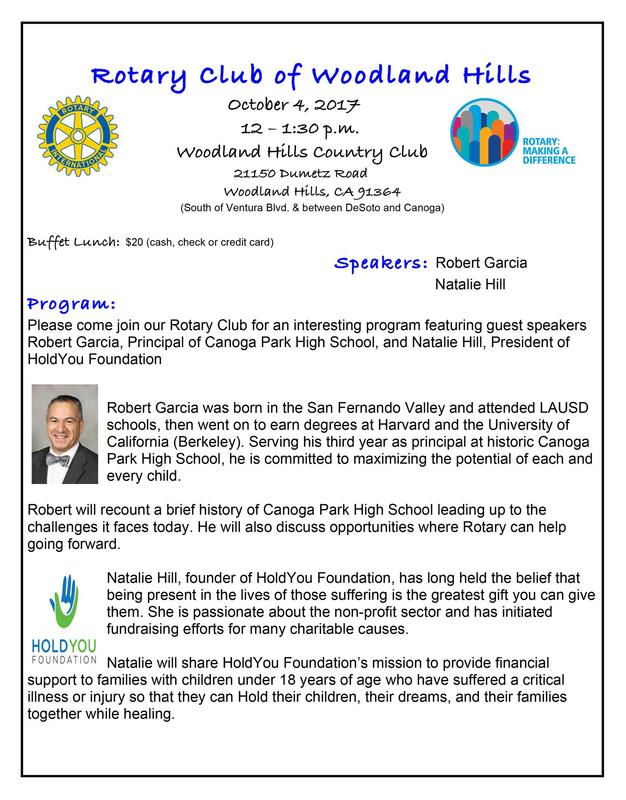 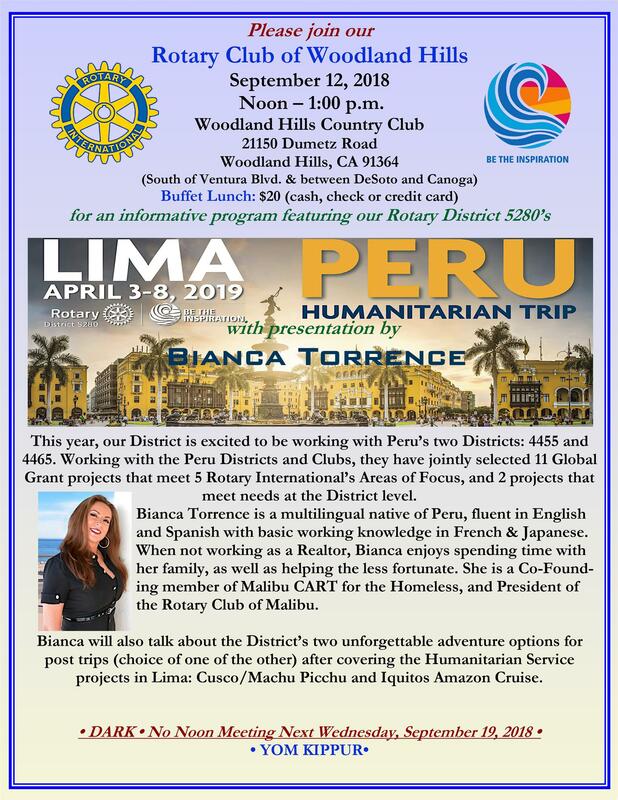 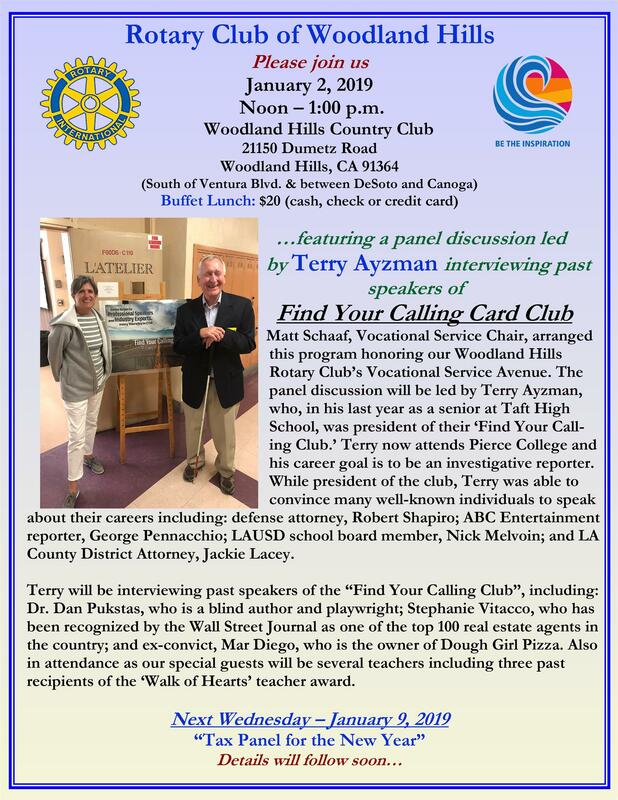 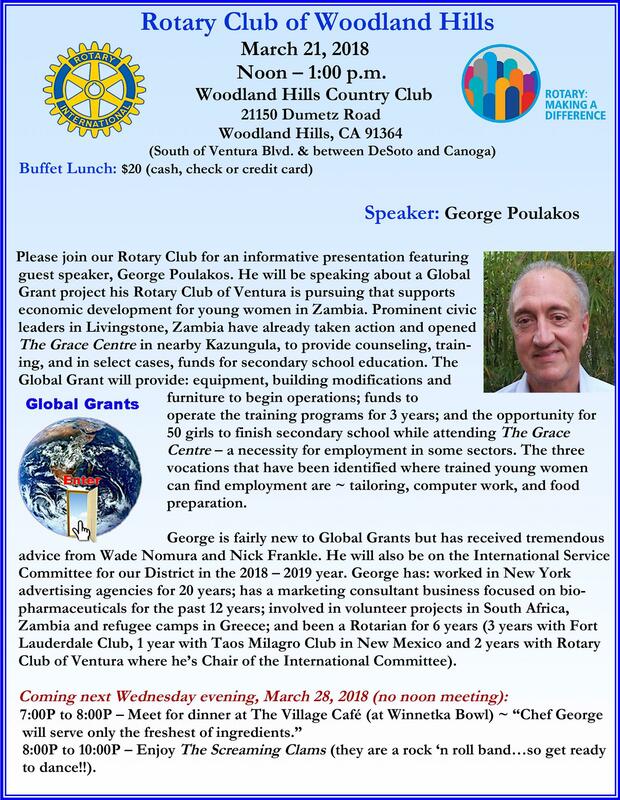 October 10, 2018 • Everything you ever wanted to know about our Rotary Foundation! 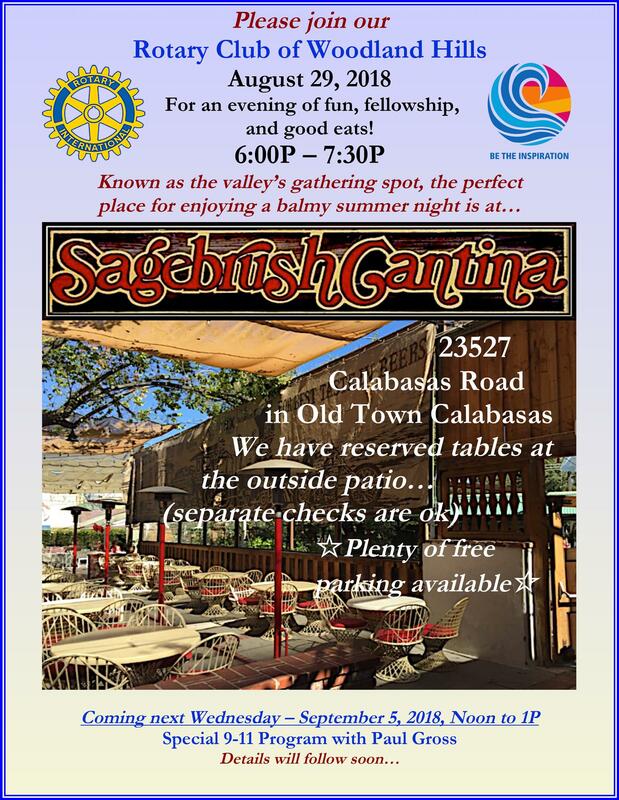 August 29 , 2018 ✻ No Noon Meeting ✻ Wednesday Night Fun and Fellowship at Sagebrush Cantina! 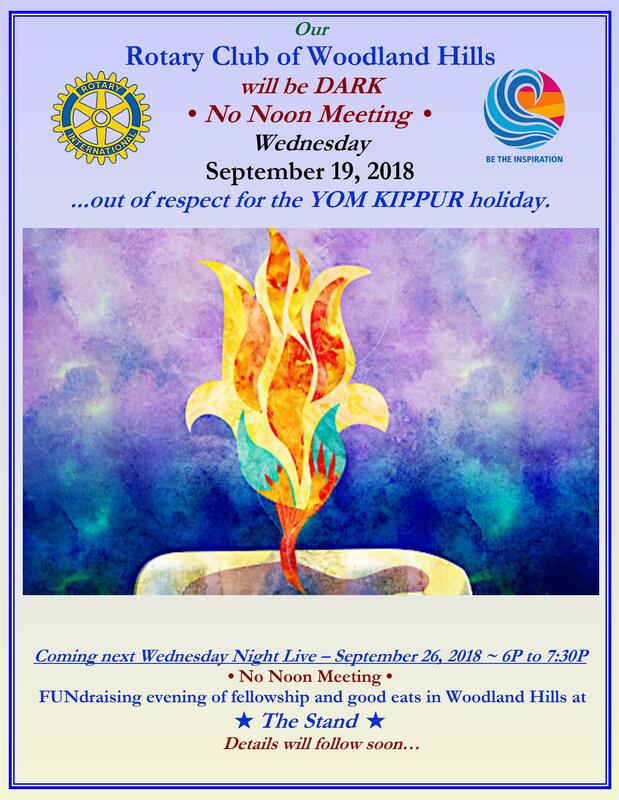 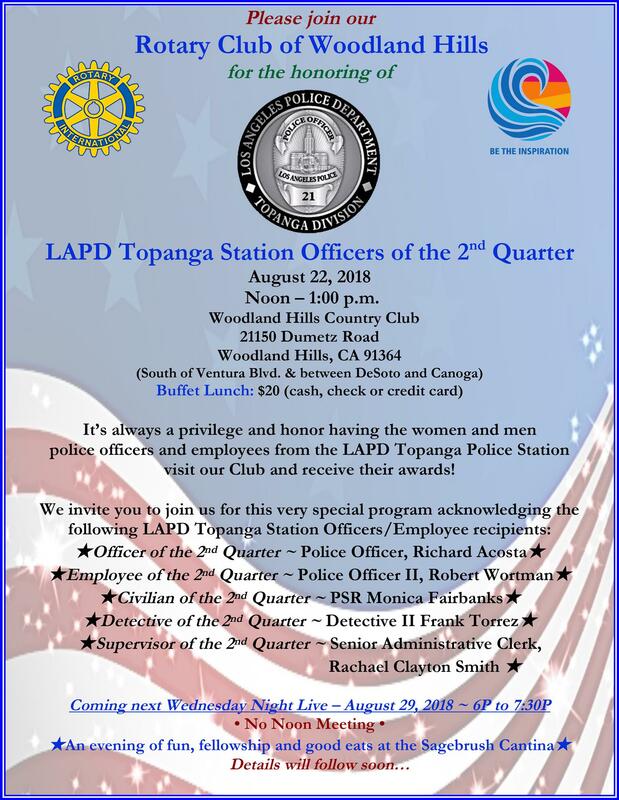 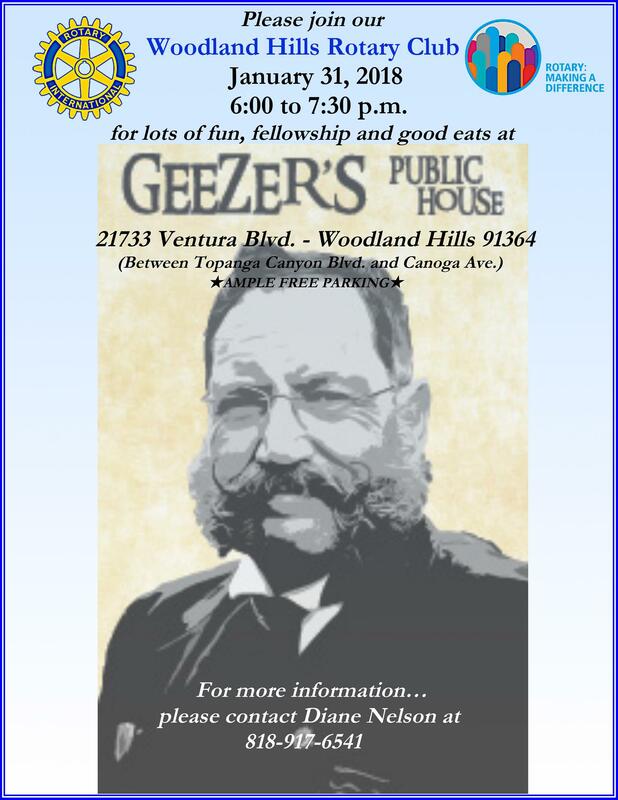 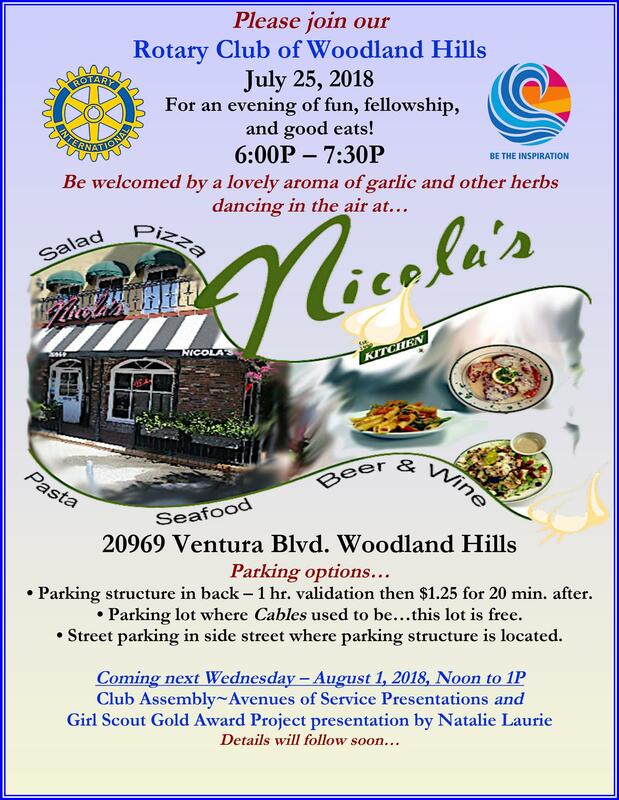 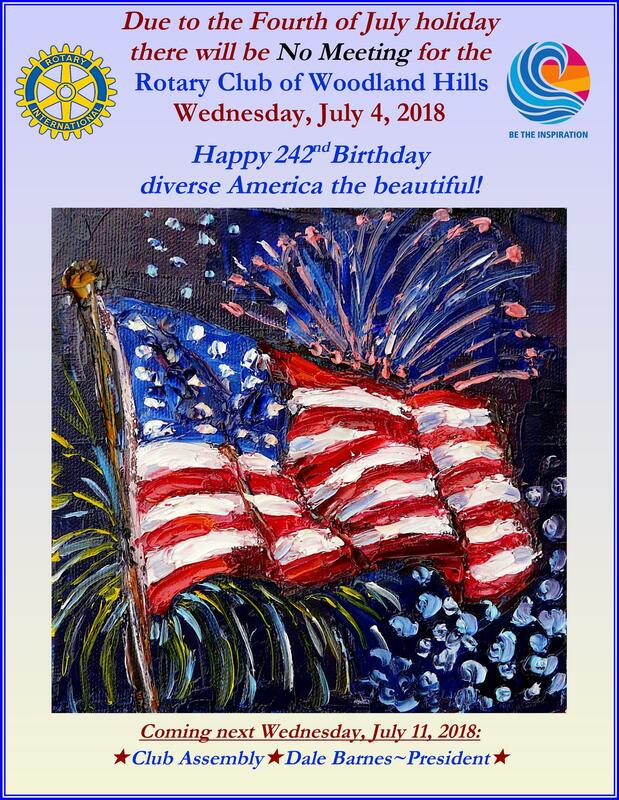 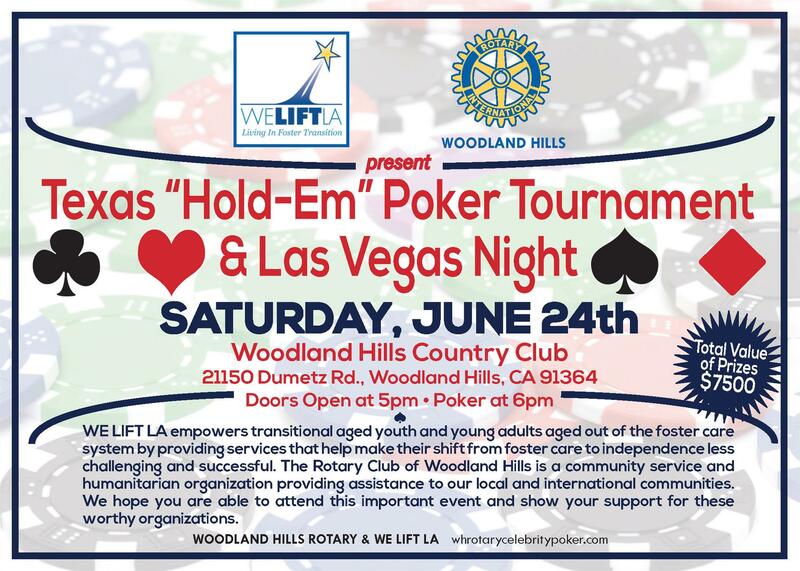 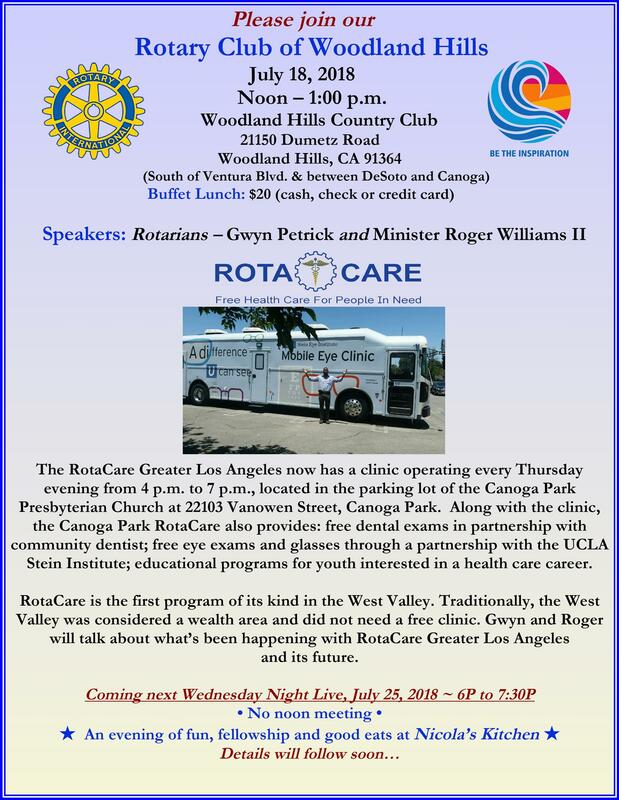 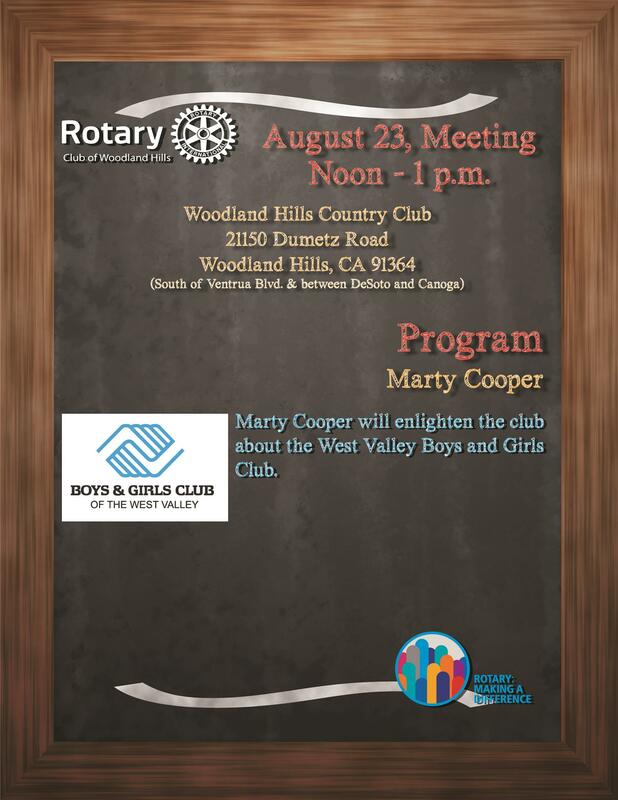 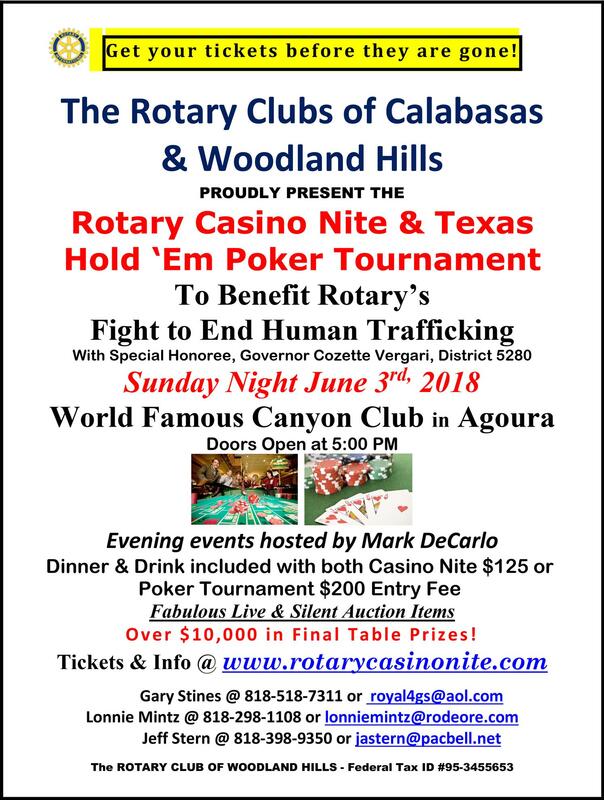 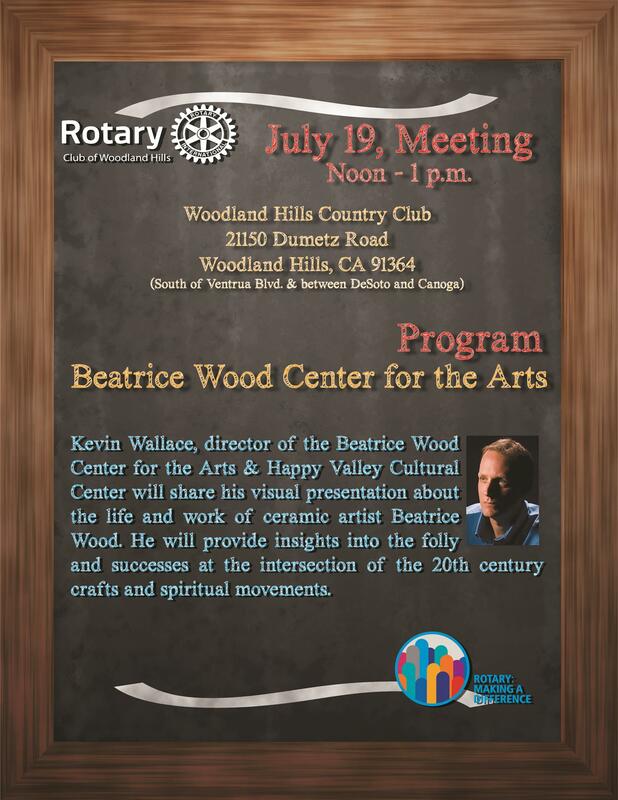 July 25, 2018 • No Noon Meeting • Wednesday Night Fun, Social and Good Eats! 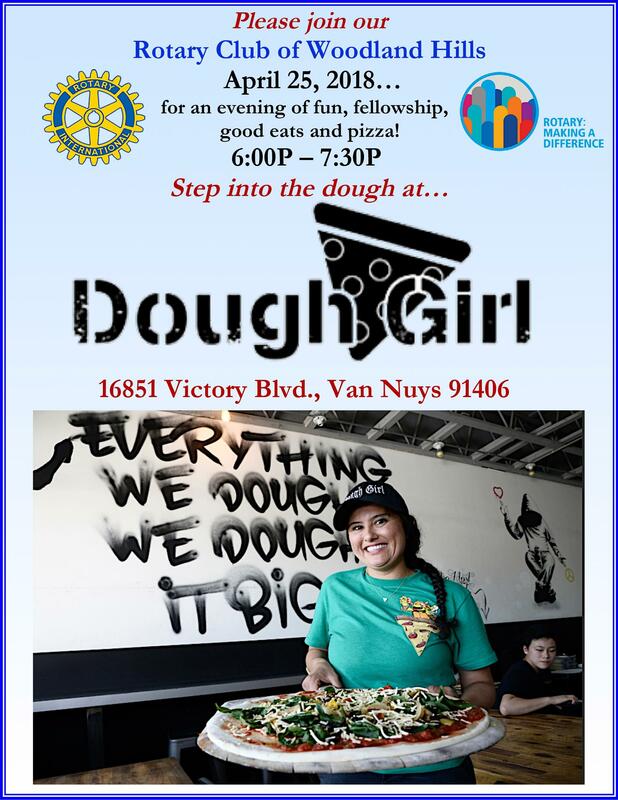 June 27, 2018 • No Noon Meeting • "Step Into The Dough" Wednesday Night Fun, Social, Good Eats and Pizza! 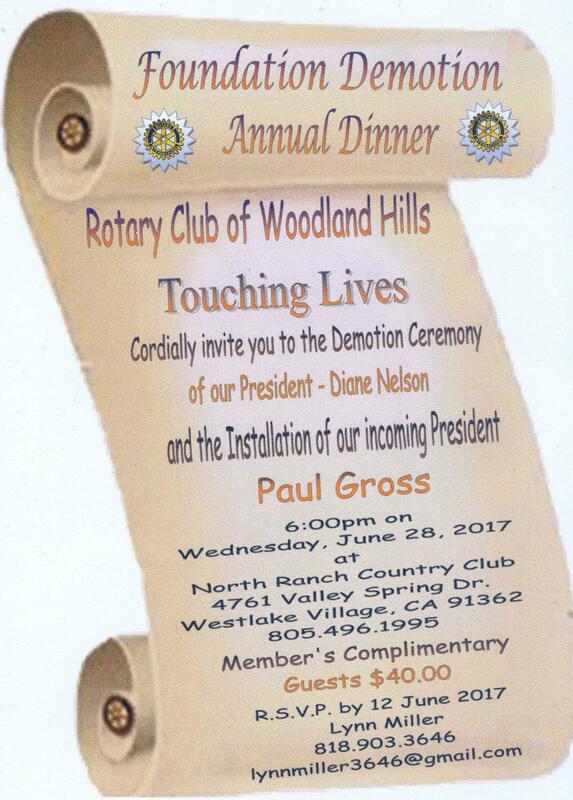 Google Maps directions, please "click" here. 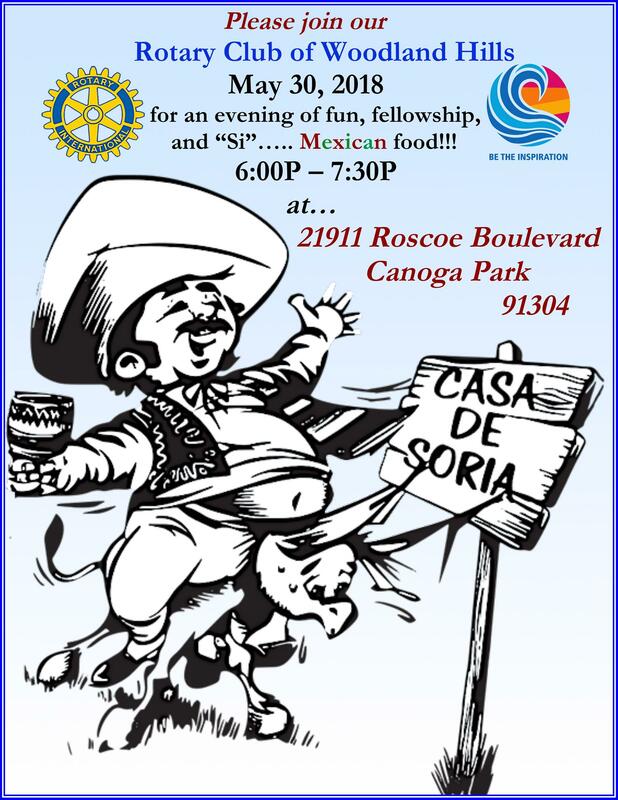 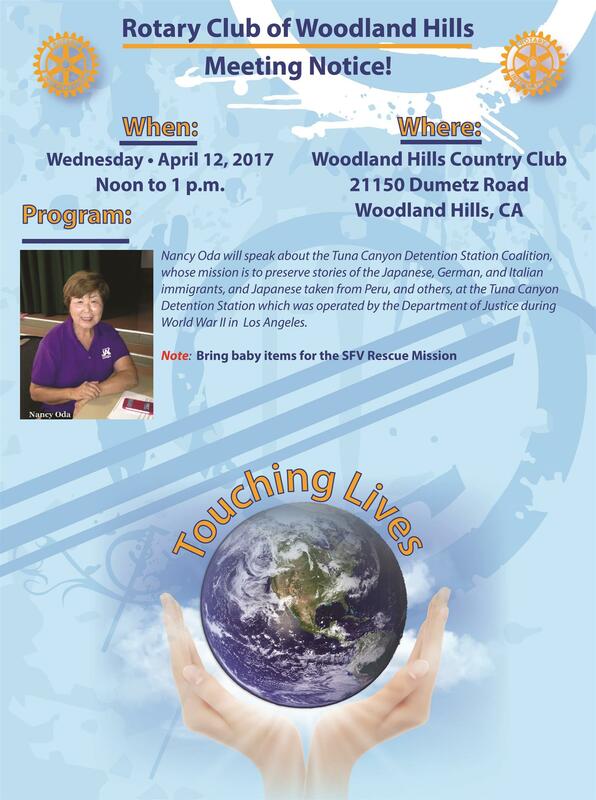 May 30, 2018 • No Noon Meeting • An Evening Of Fun, Fellowship and "Si"...Mexican Food! 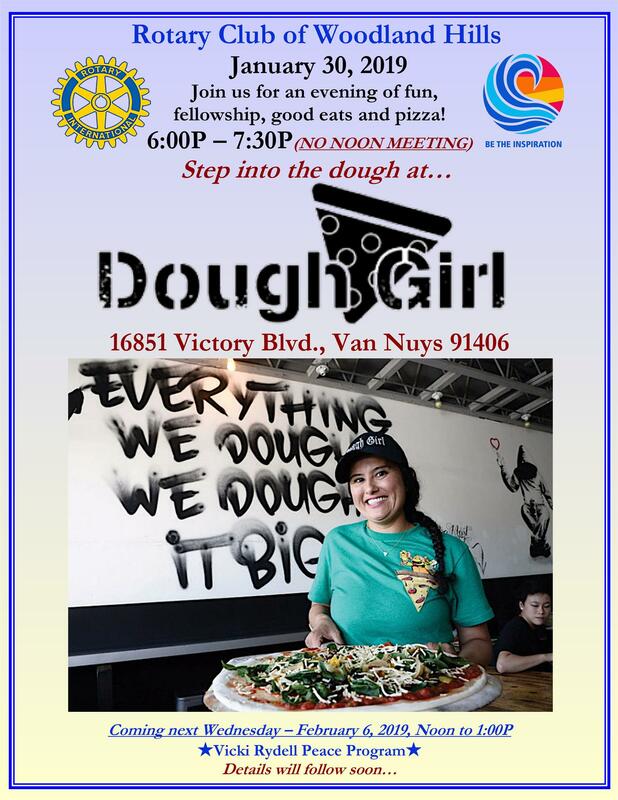 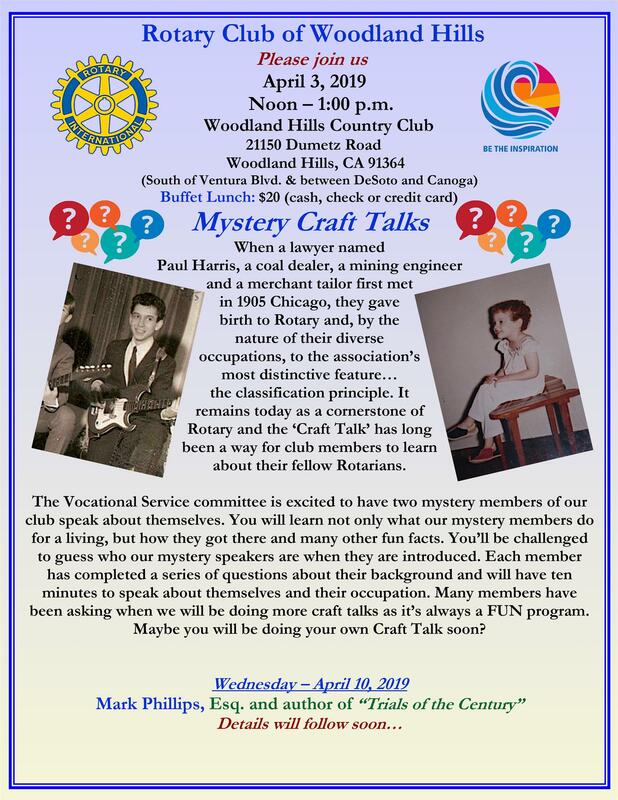 April 25, 2018 • No Noon Meeting • "Step Into The Dough" Wednesday Night Fun, Social, Good Eats and Pizza! 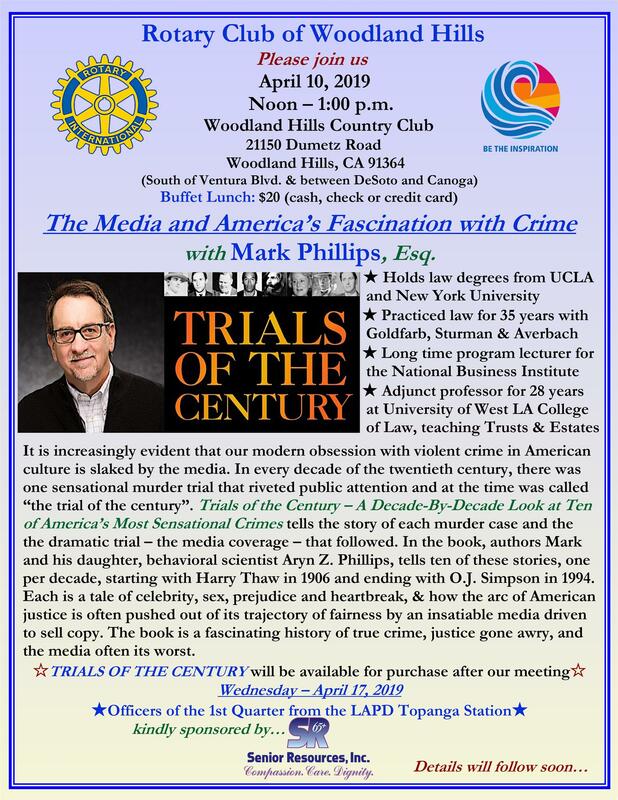 ☆ April 18, 2018 ☆ "To Be or Not To Be" Informed and Entertained! 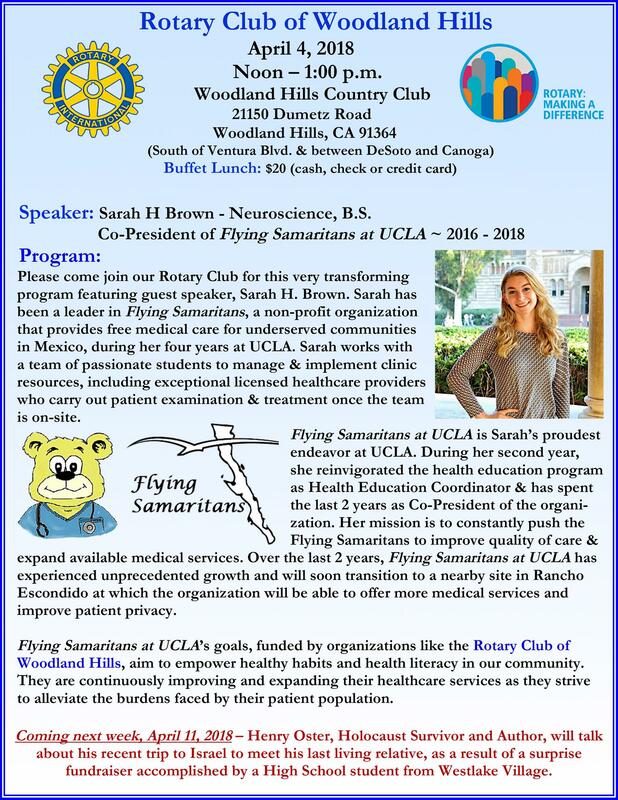 ✶April 4, 2018 ✶ Sarah Brown & the Flying Samaritans at UCLA! 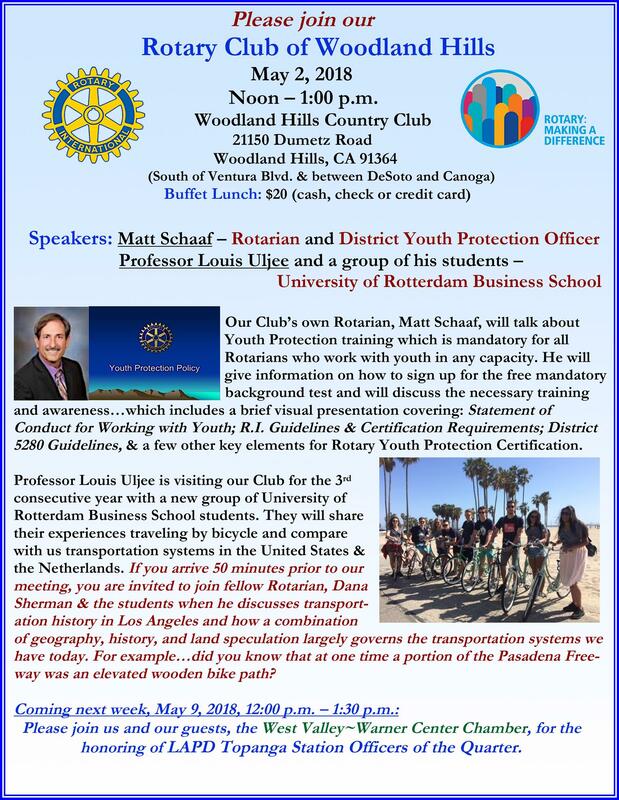 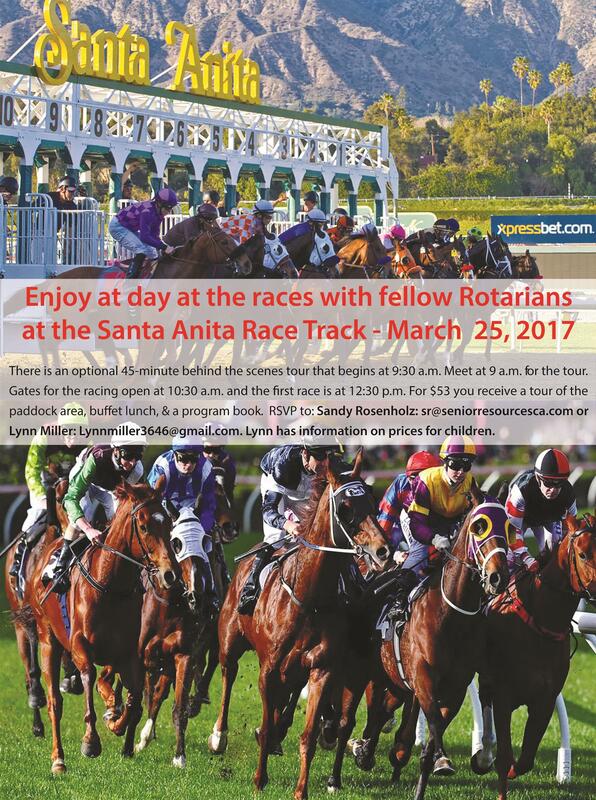 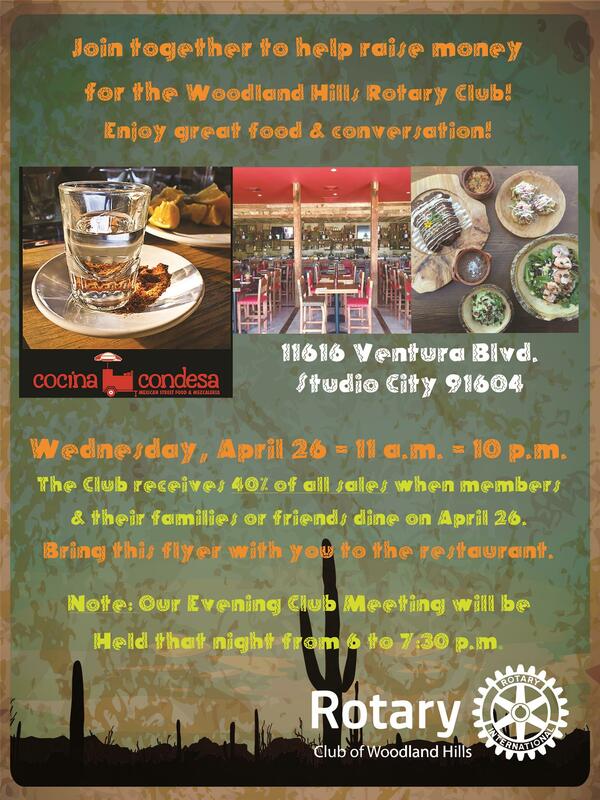 March 28, 2018 • No Noon Meeting • Wednesday Night Fun, Social, Good Eats and Dancing! 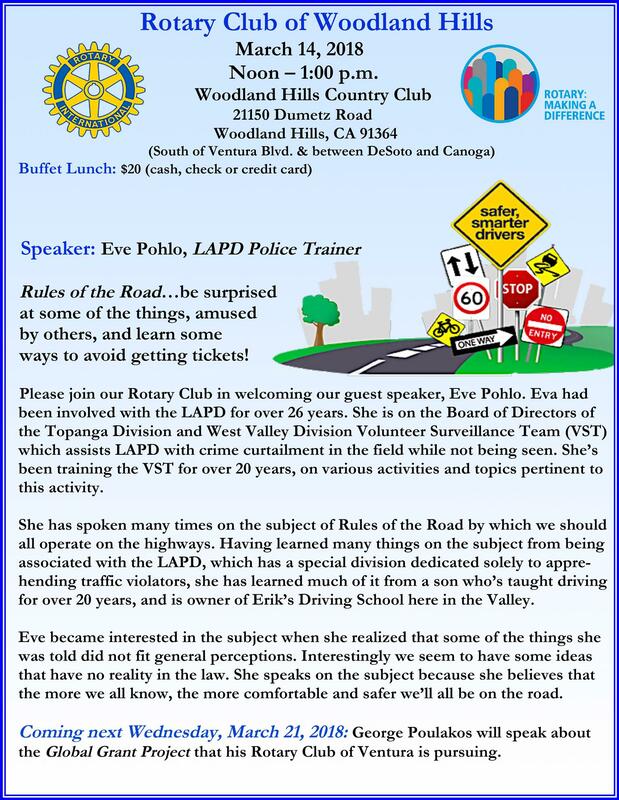 RULES OF THE ROAD ▷ Be Surprised, Amazed & Learn Ways To Avoid Tickets! 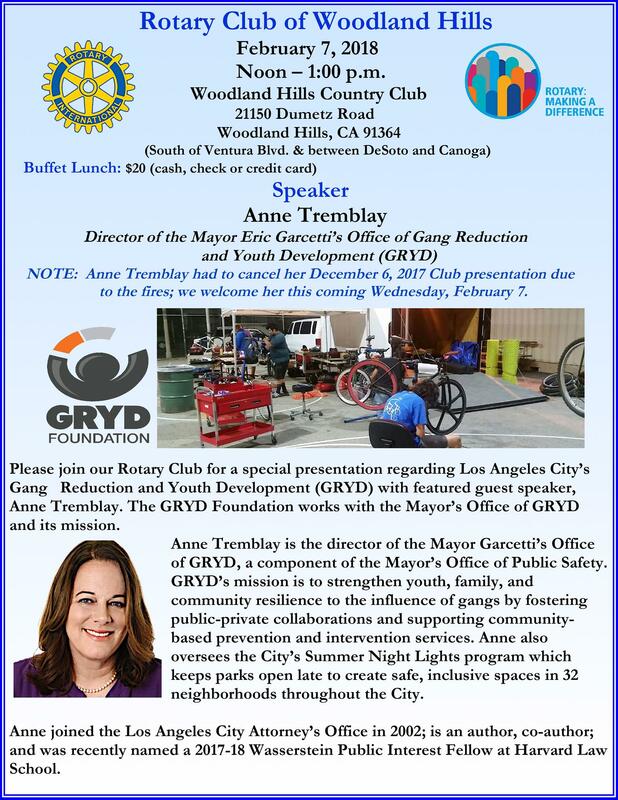 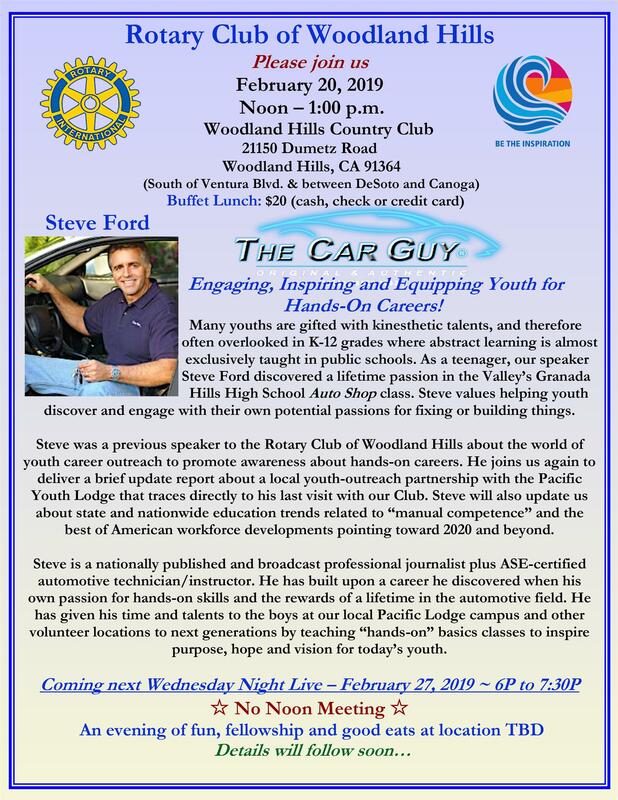 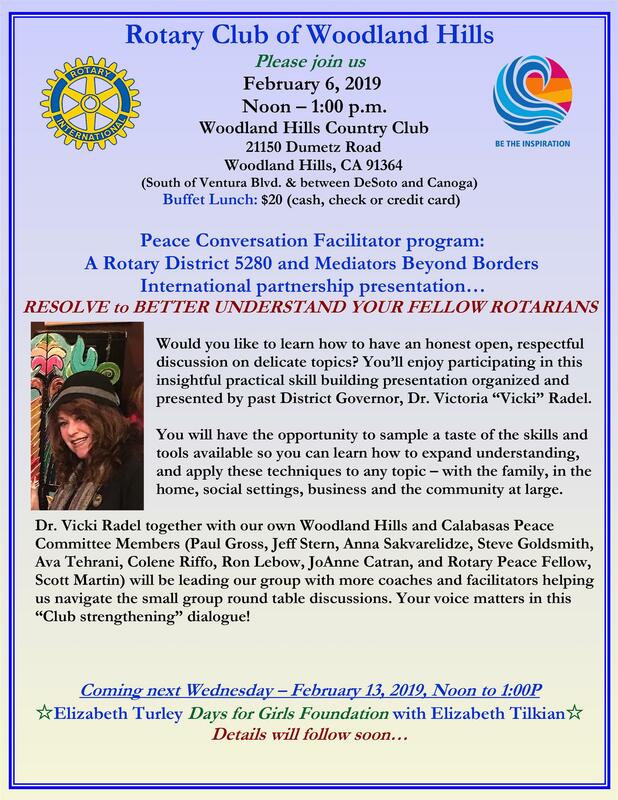 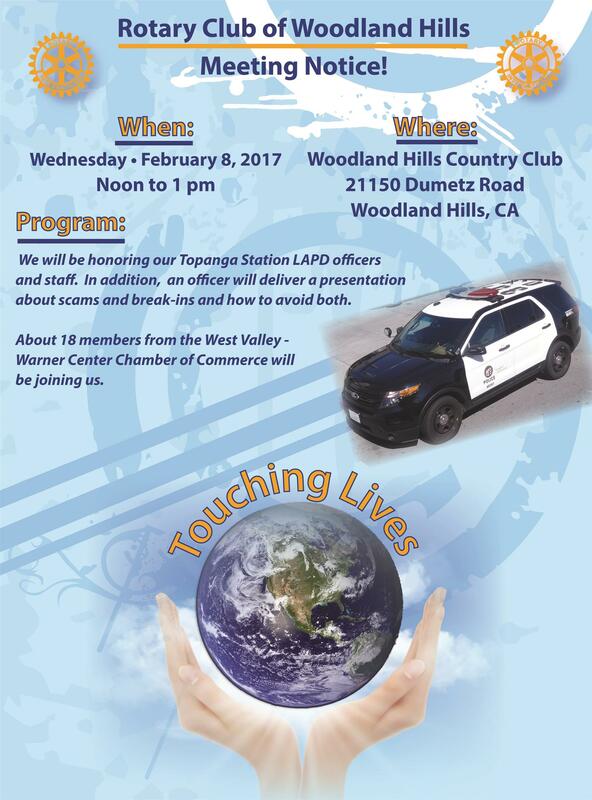 February 28, 2018 • No Noon Meeting • Wednesday Night Fun, Social and Good Eats! 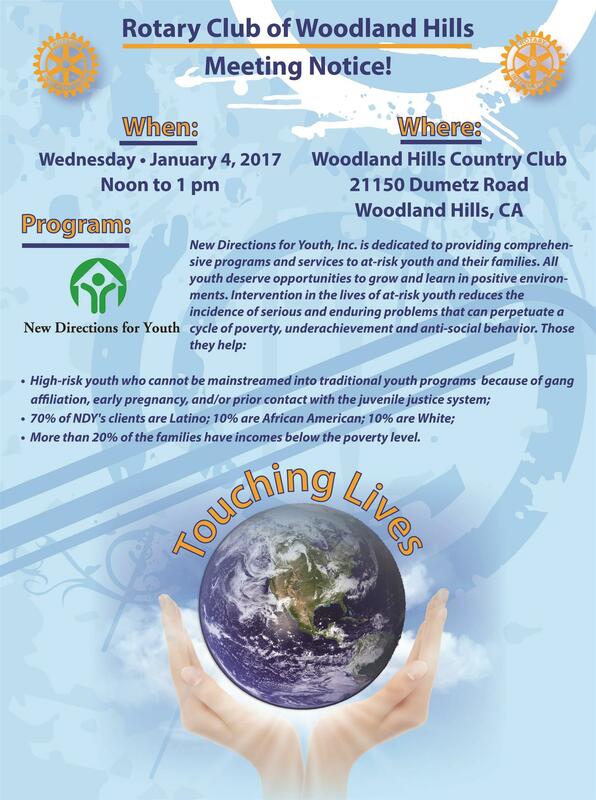 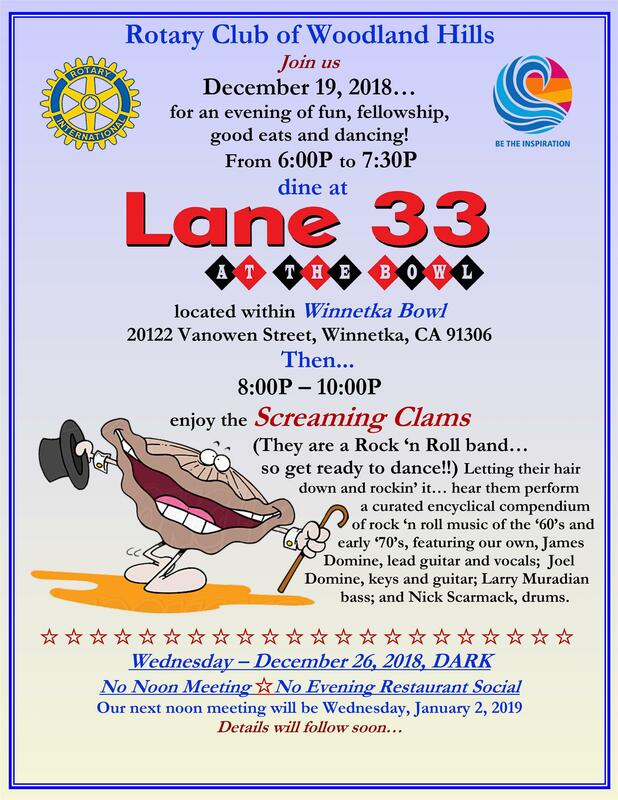 January 31, 2018 • No Noon Meeting • Wednesday Night Fun, Social and Good Eats! 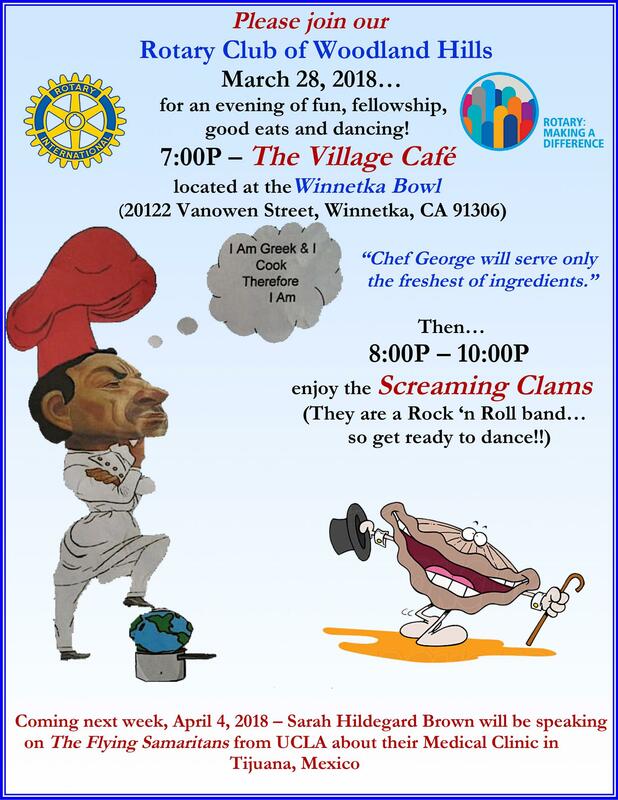 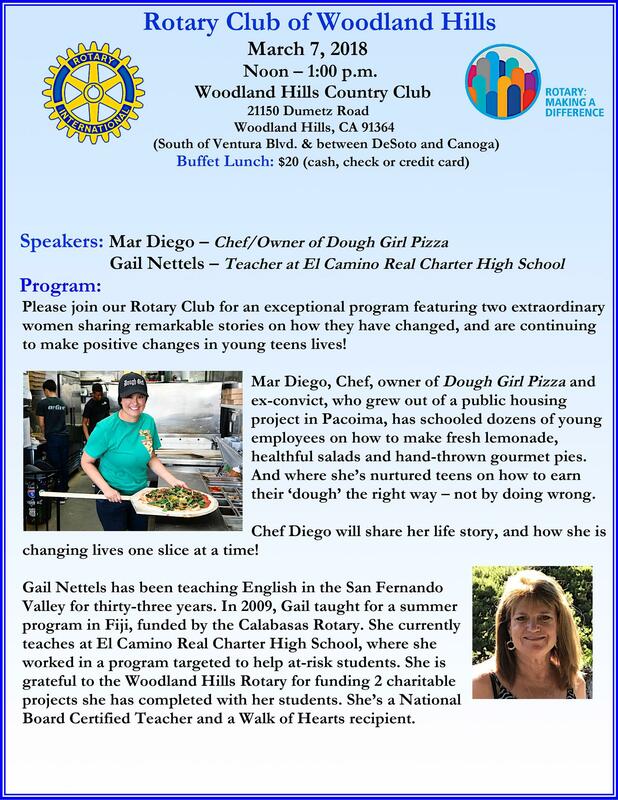 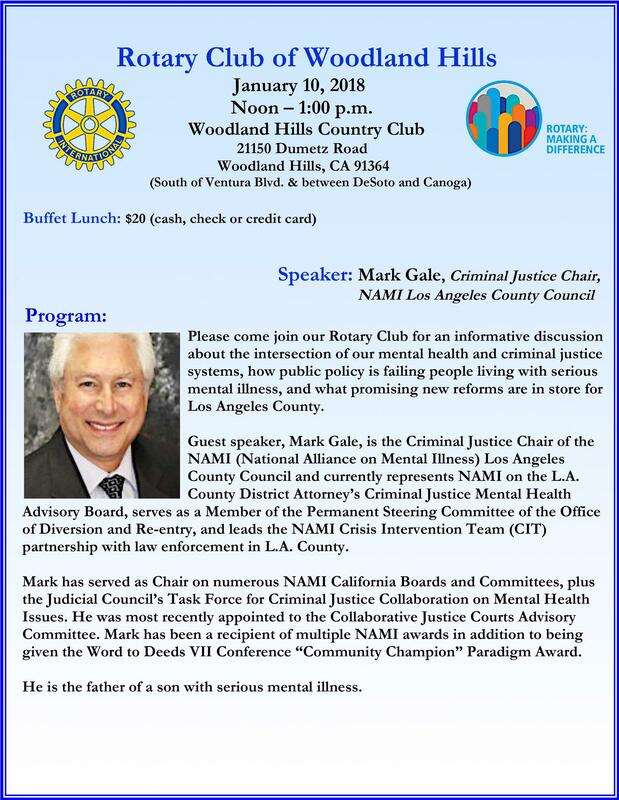 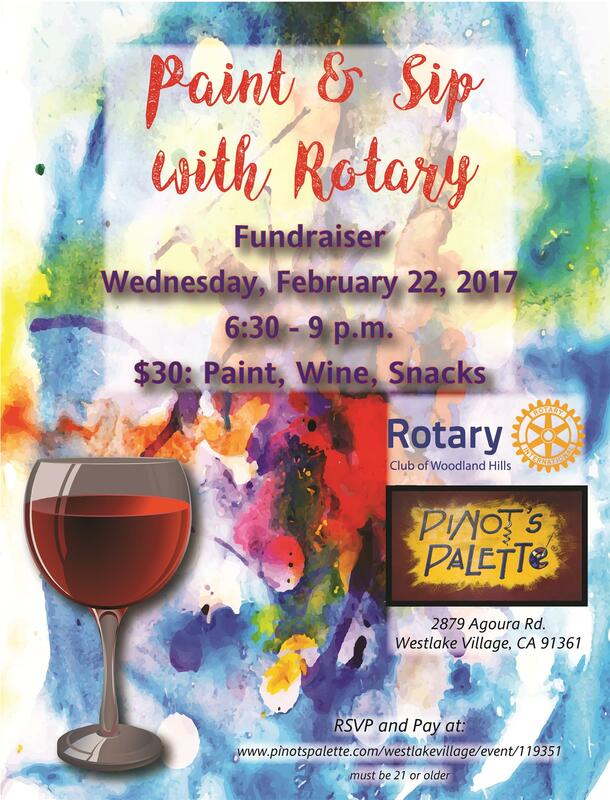 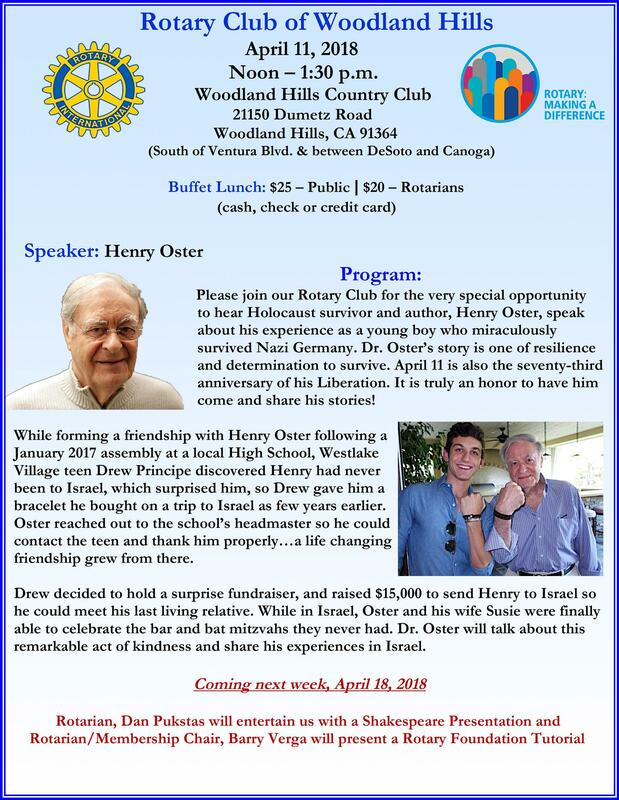 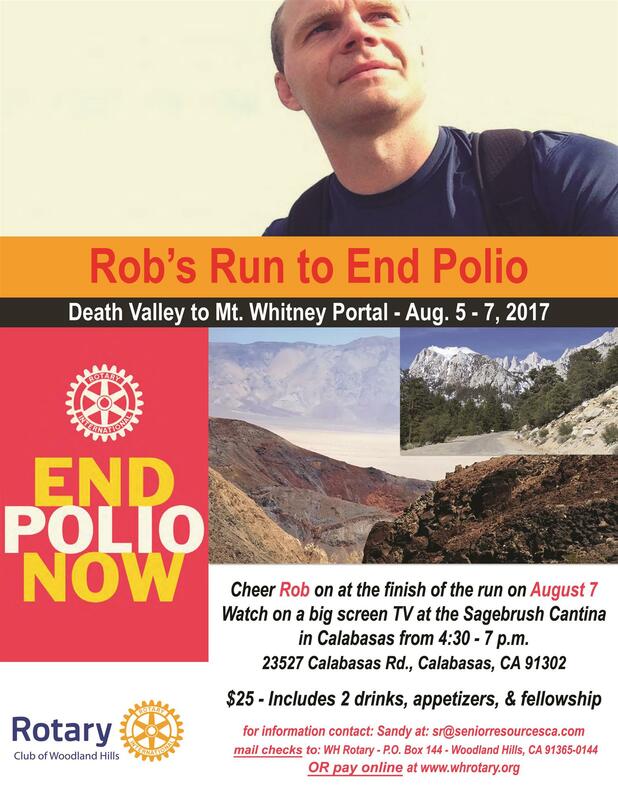 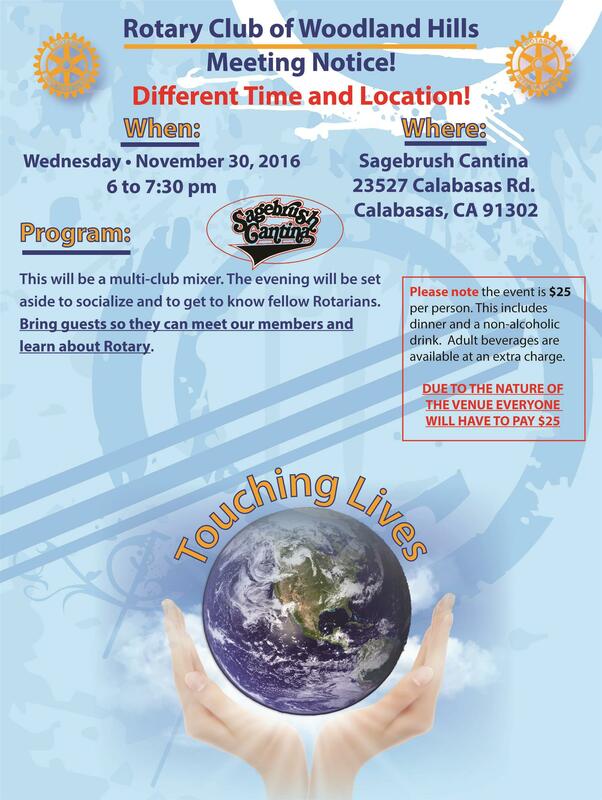 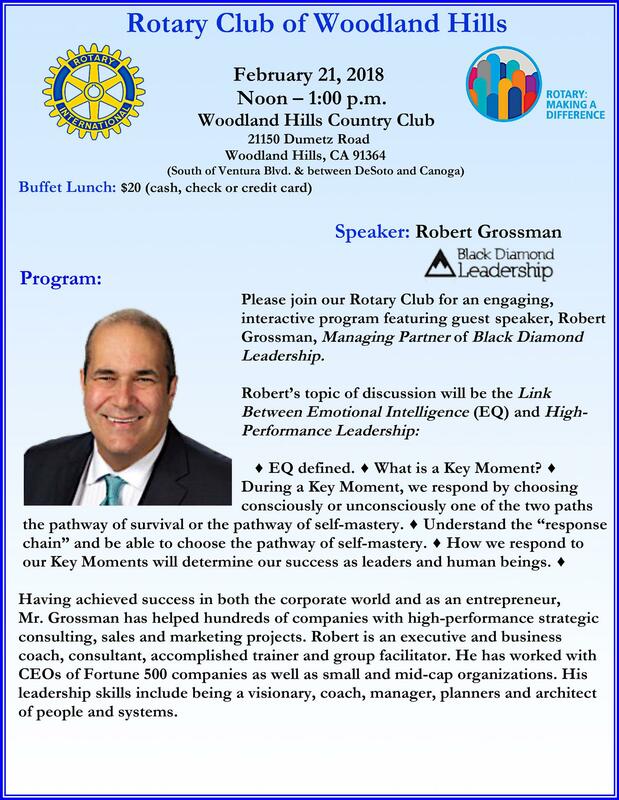 December 27, 2017 at 6:00 p.m.
🔸When entering the restaurant, mention "Rotary Club"
November 29, 2017 at 6:00 p.m. 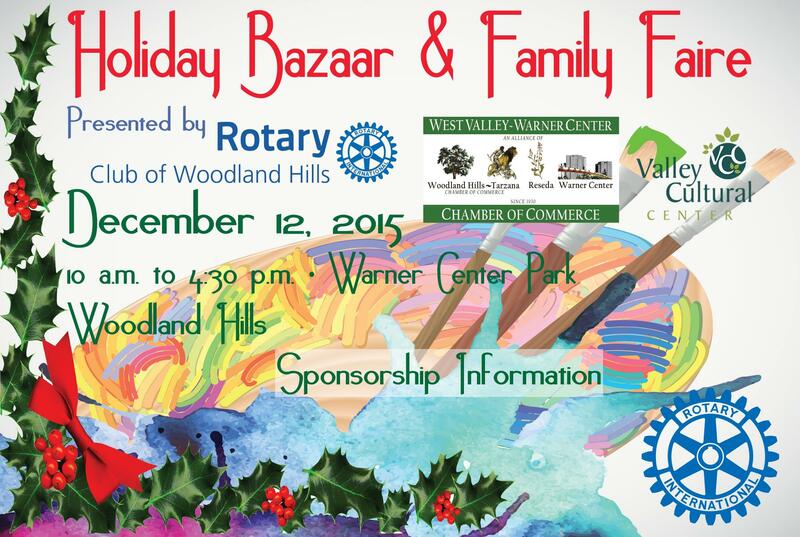 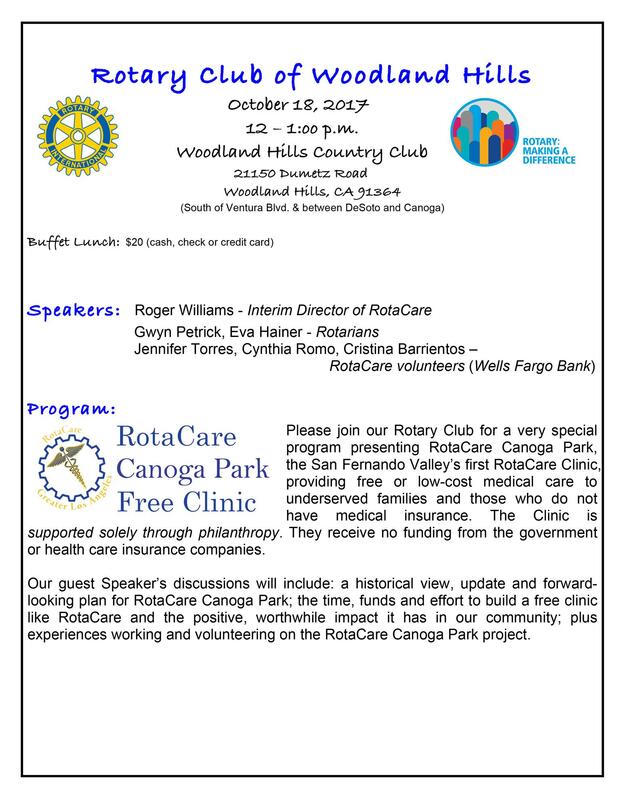 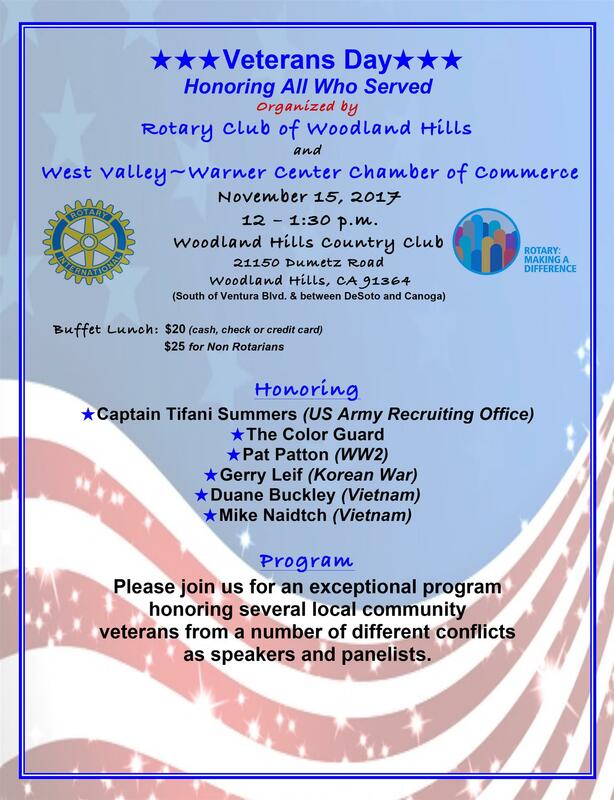 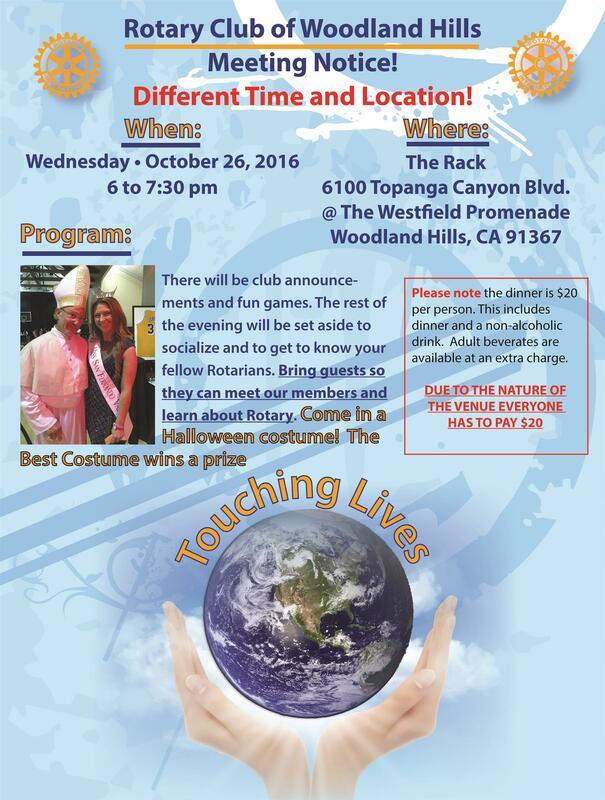 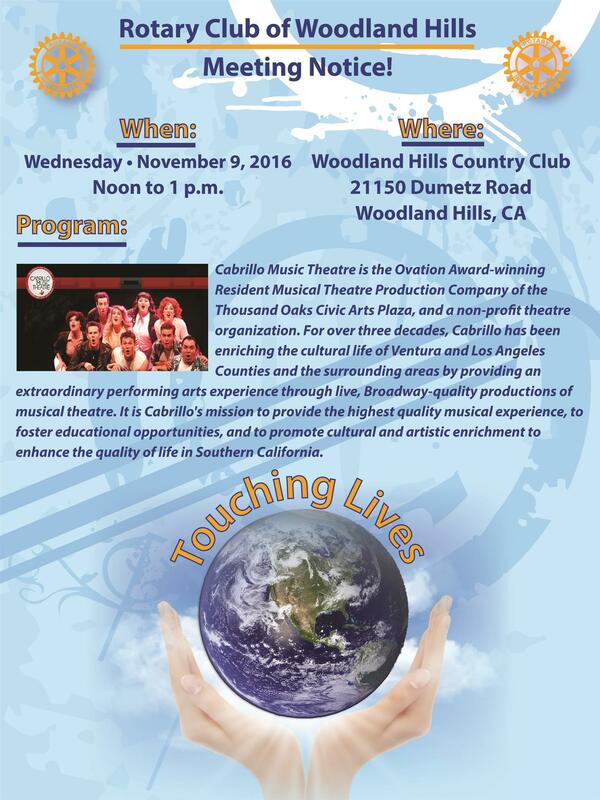 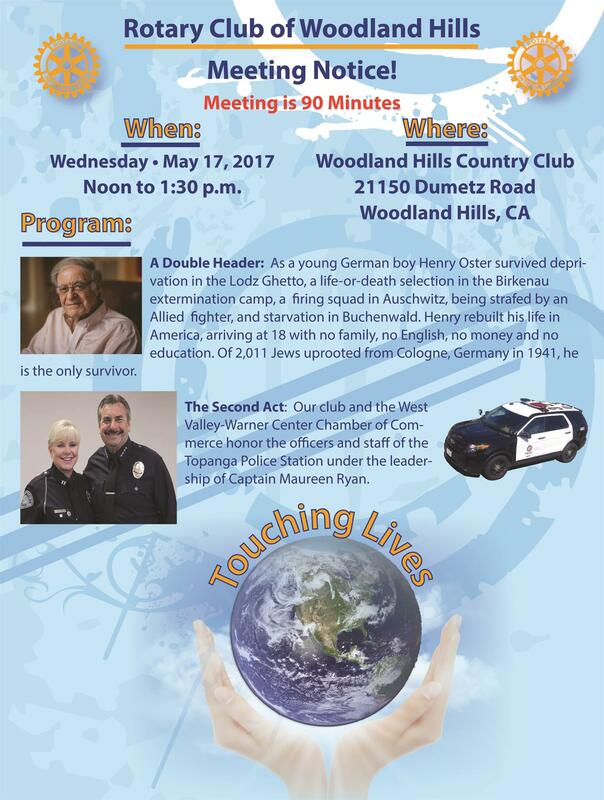 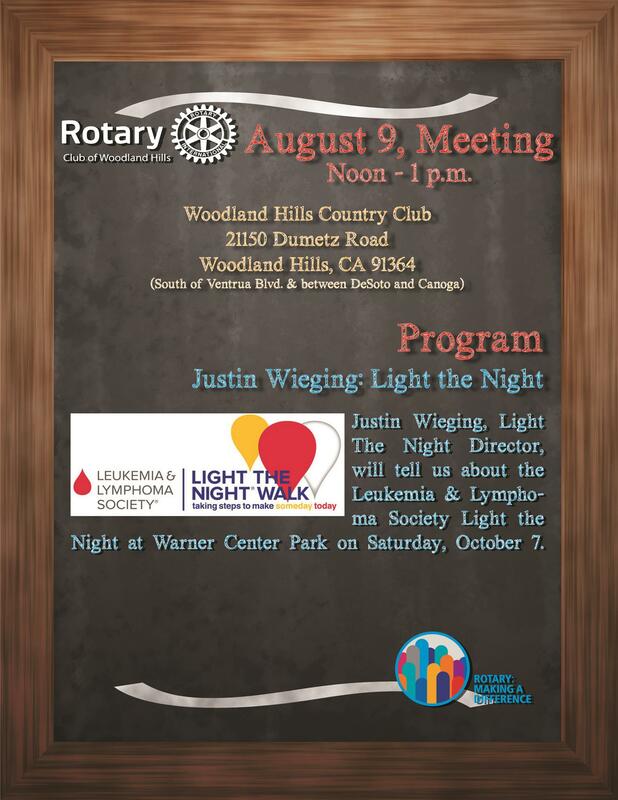 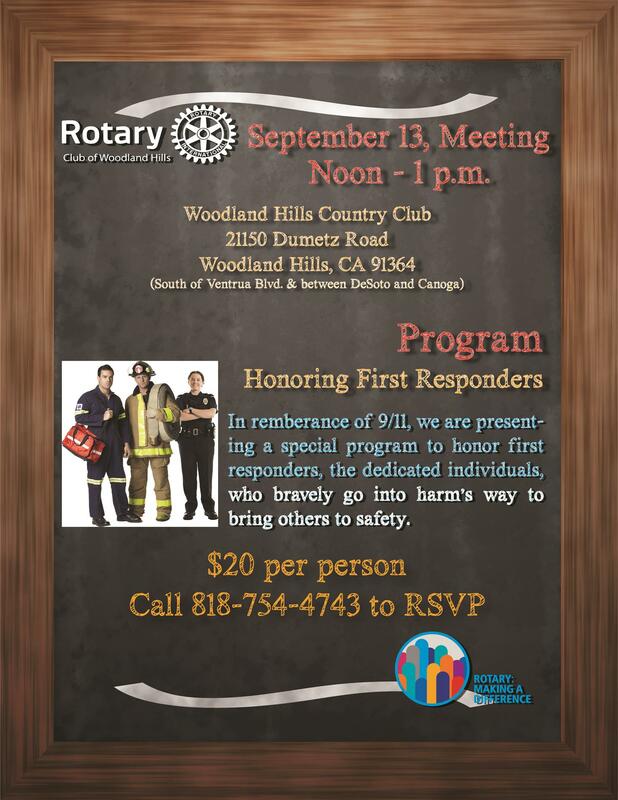 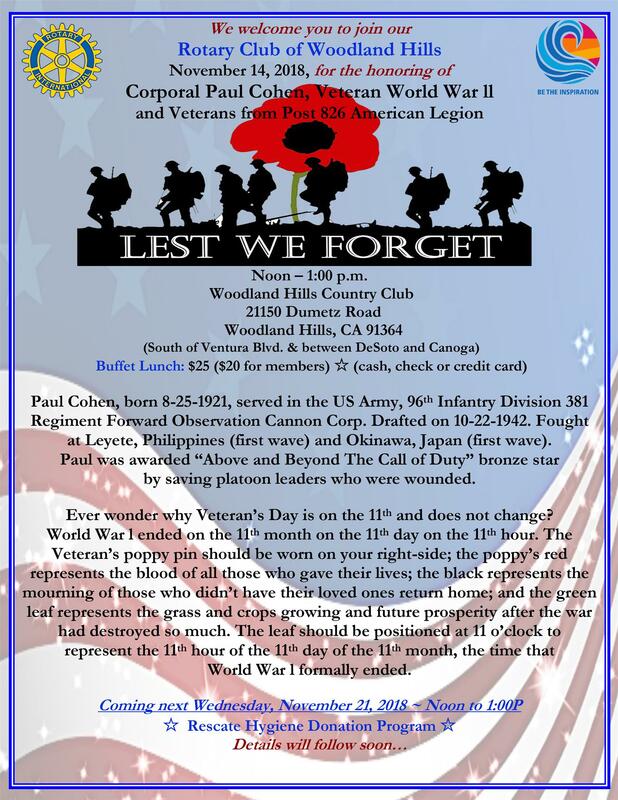 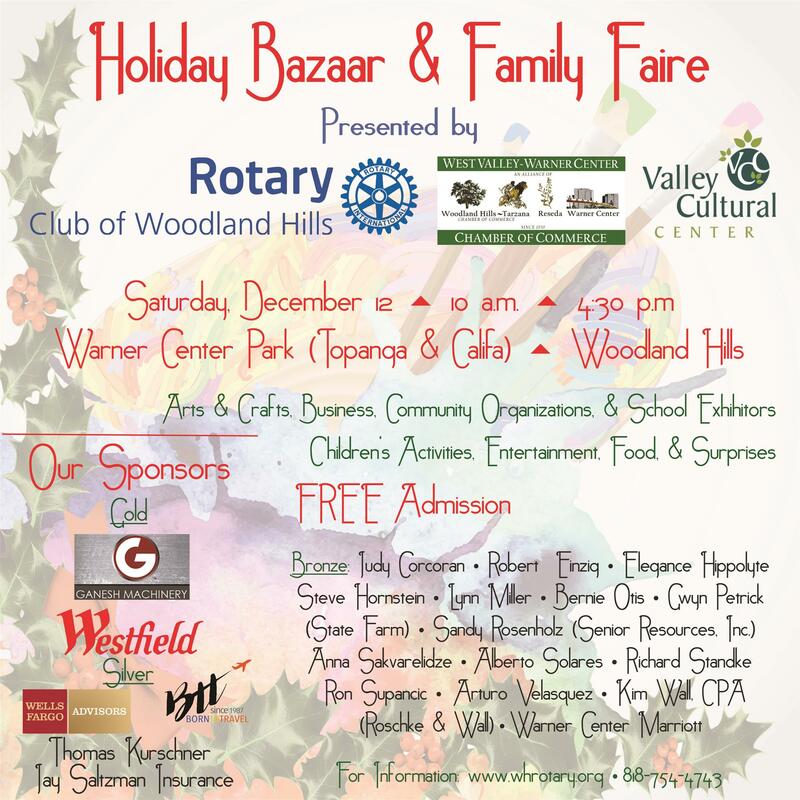 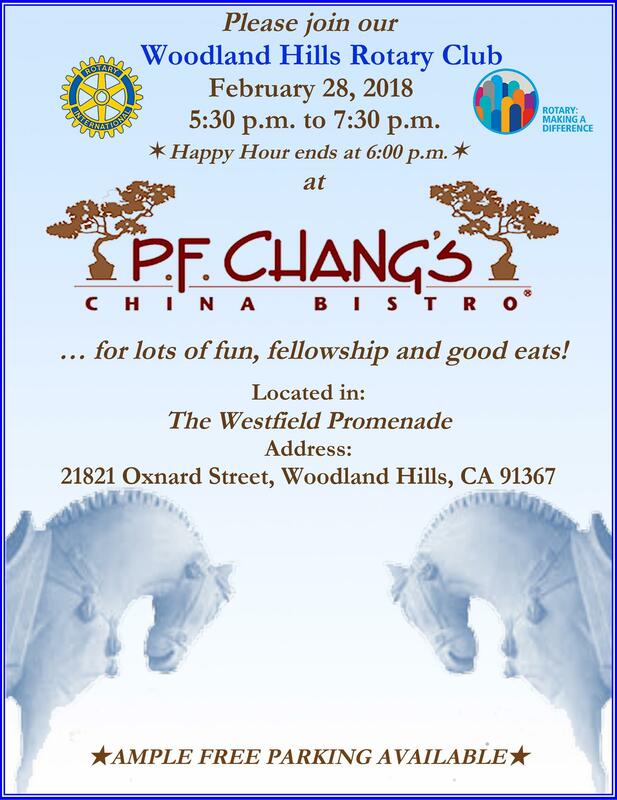 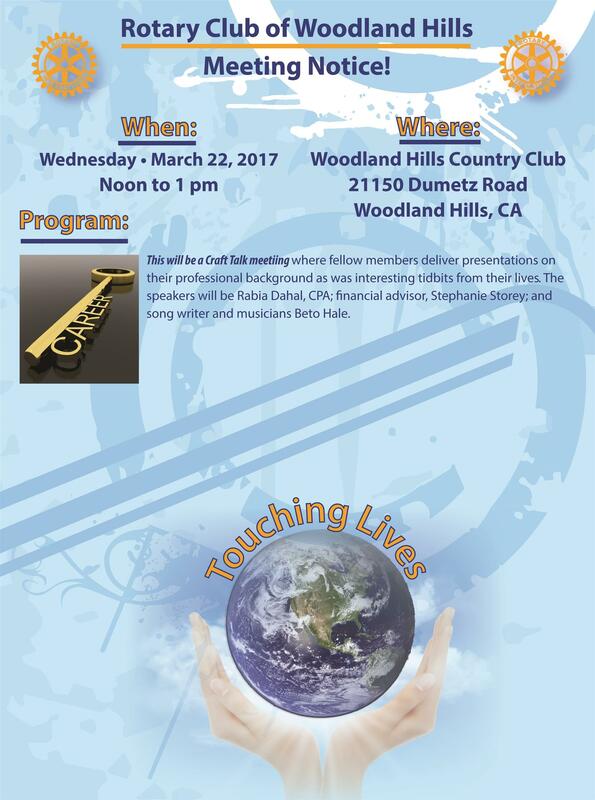 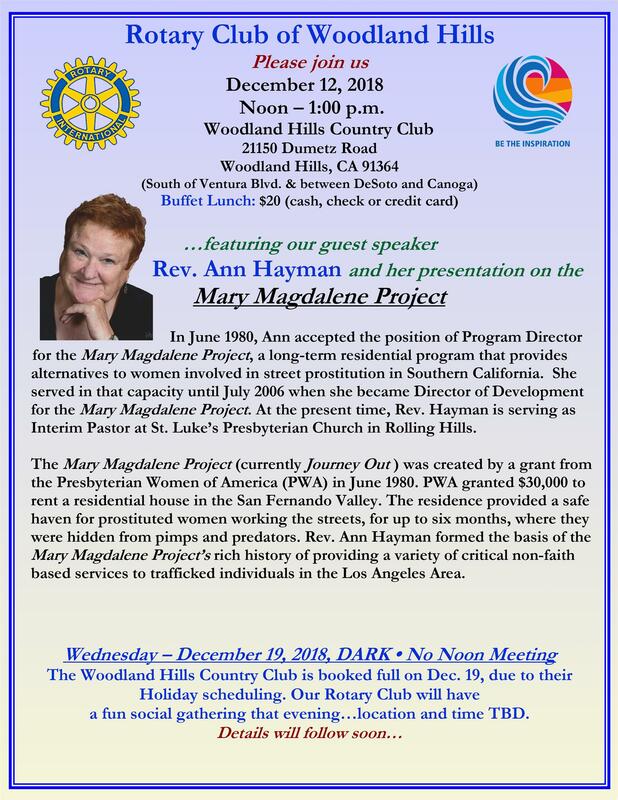 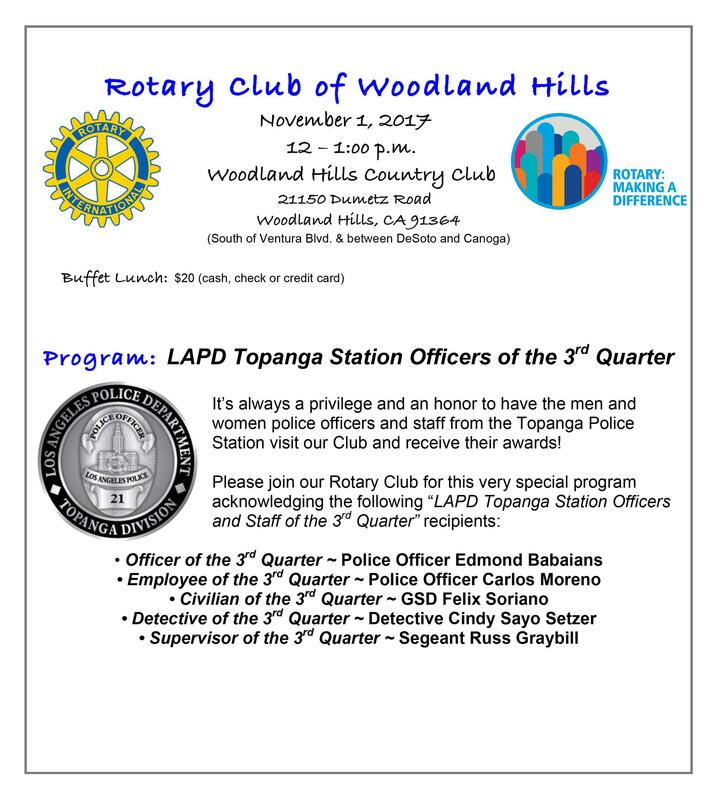 Dark November 22, 2017 - In honor of Thanksgiving, there will be no Woodland Hills Rotary Club meeting. 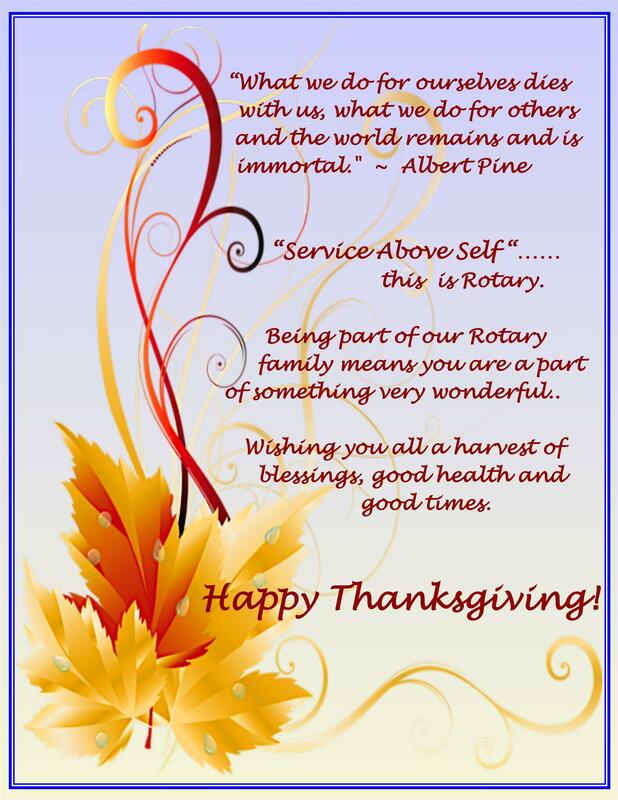 Wishing you all a peaceful, safe and memorable Thanksgiving! 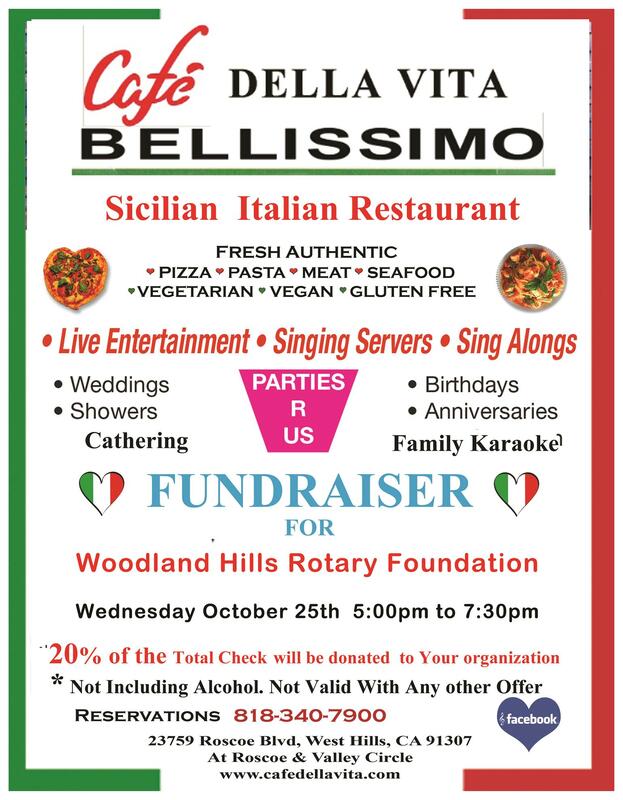 food at Café Della Vita Bellissimo! 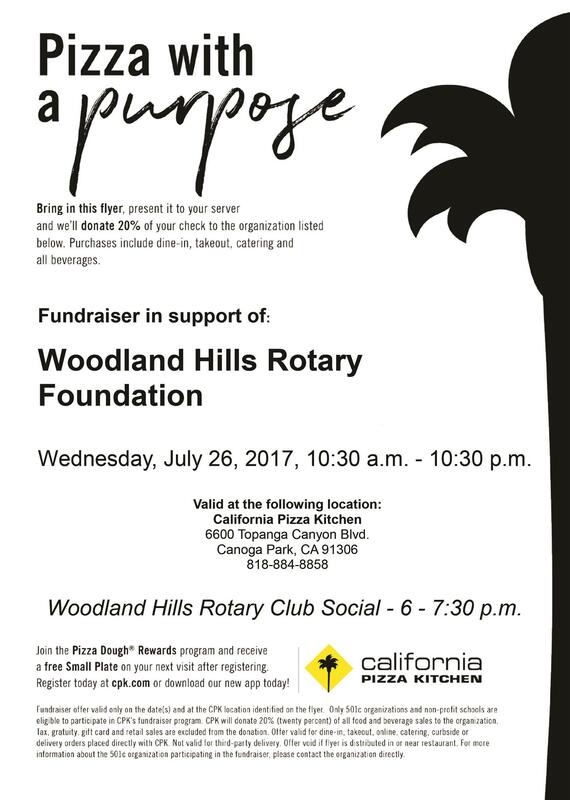 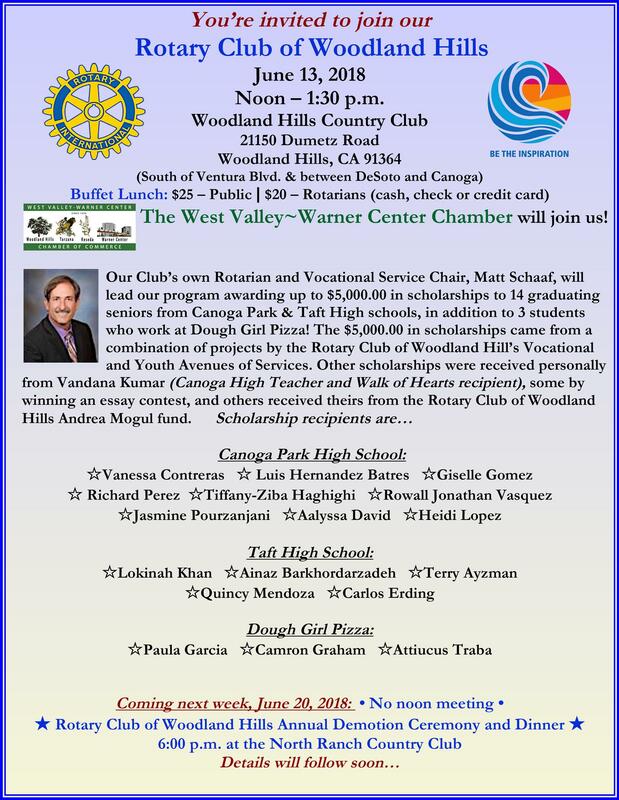 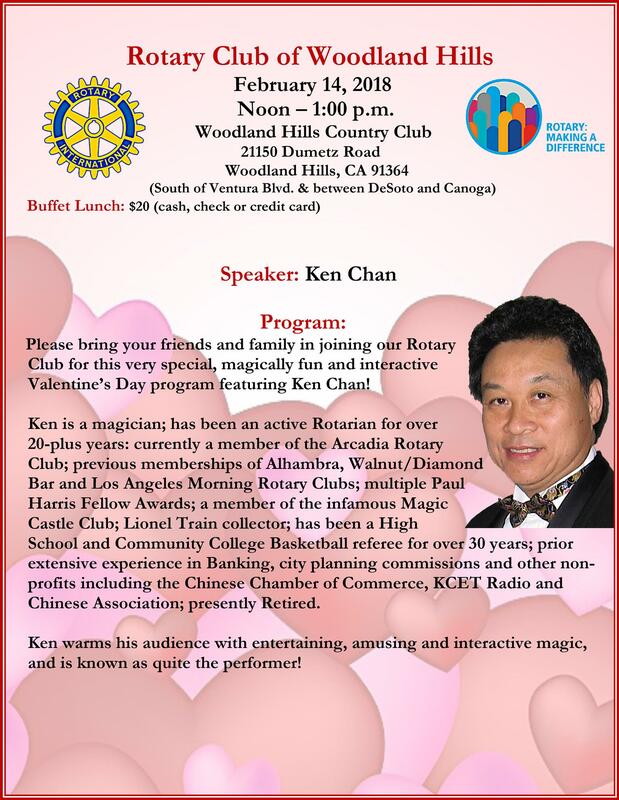 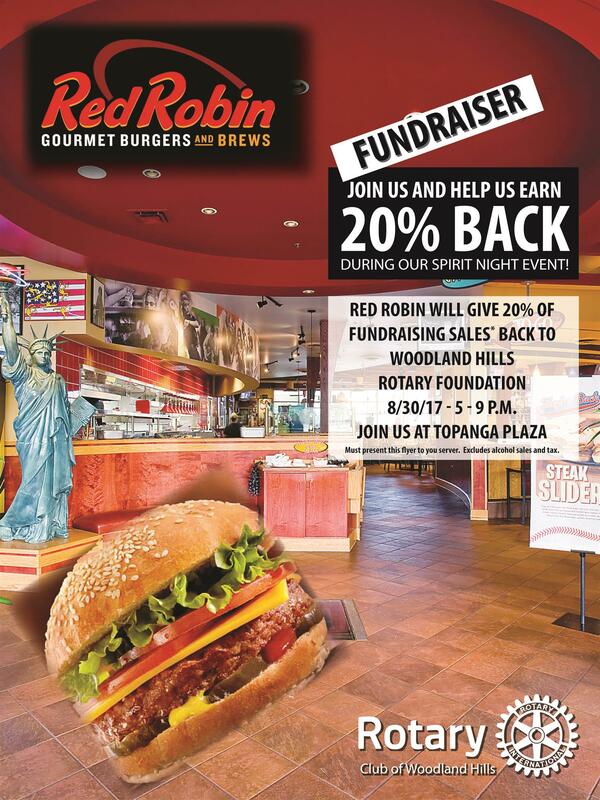 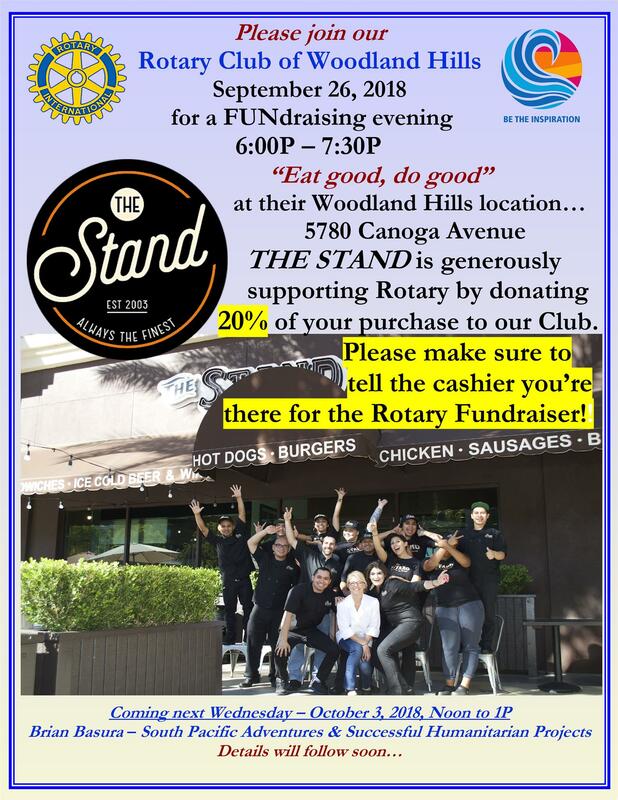 Present a copy of this flyer to your server (anytime between 5:00 p.m.
Family of Rotary surprise.Shhhh! 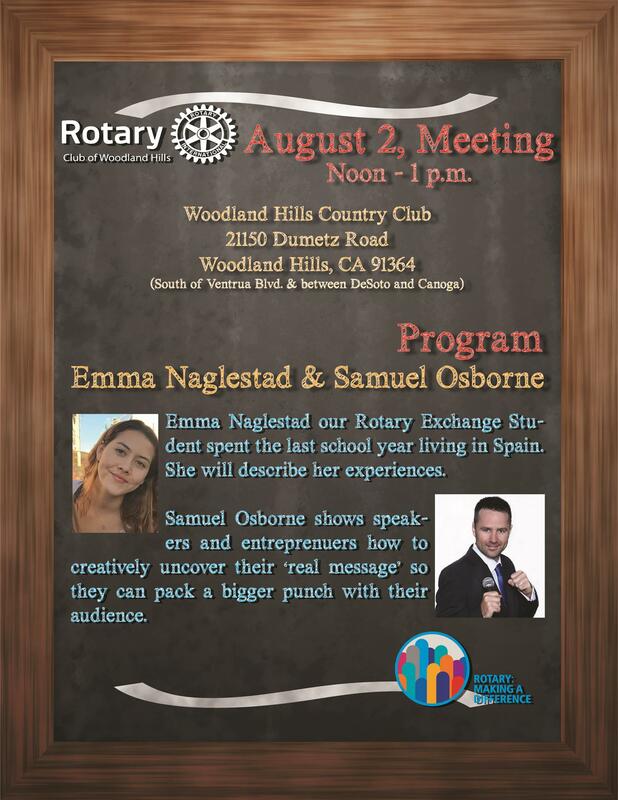 It's a secret . 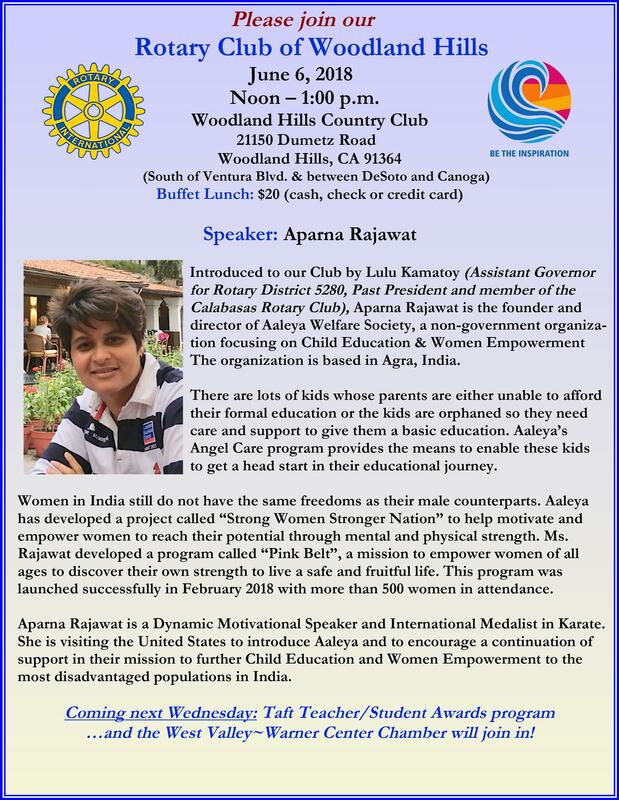 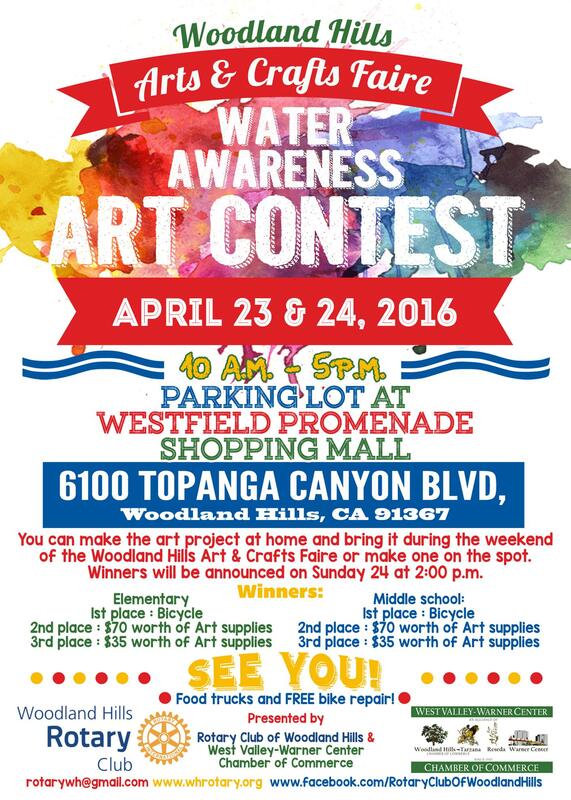 To register for the event online click on the picture. 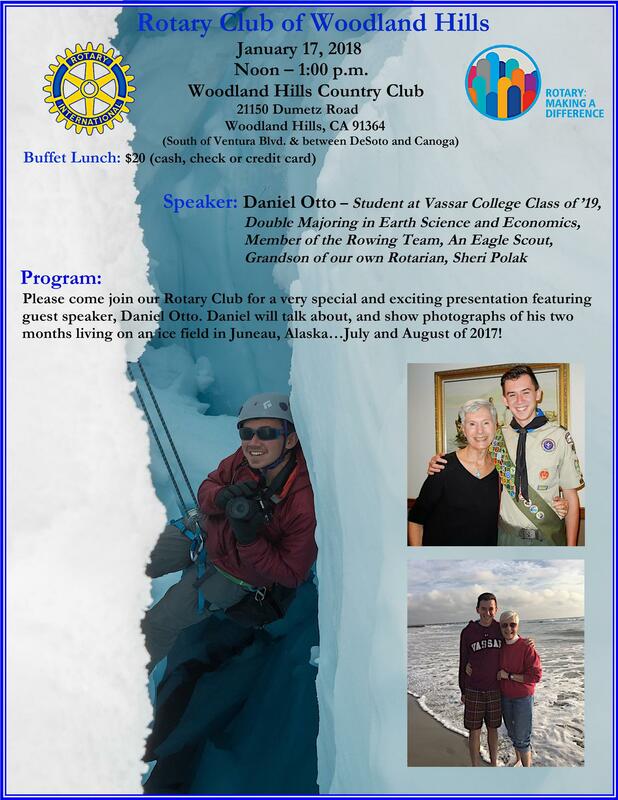 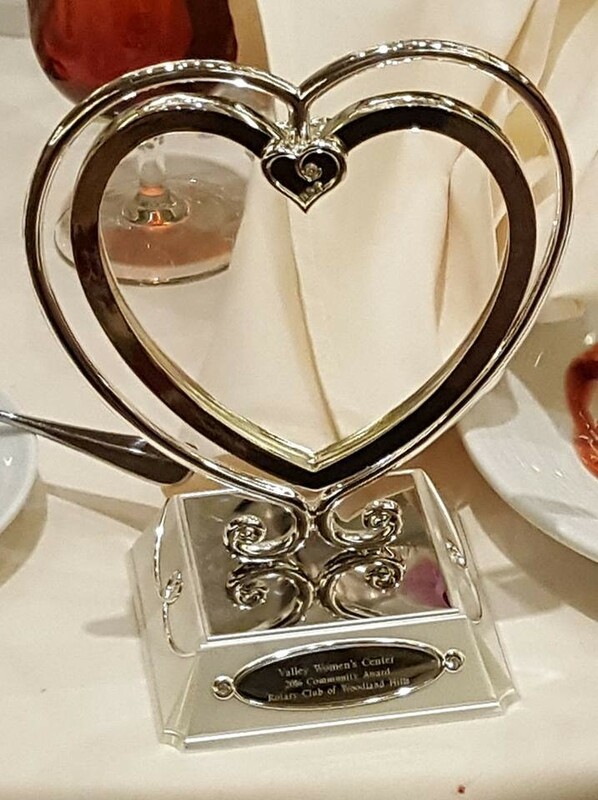 Posted by Michael S. Turner, M.S. 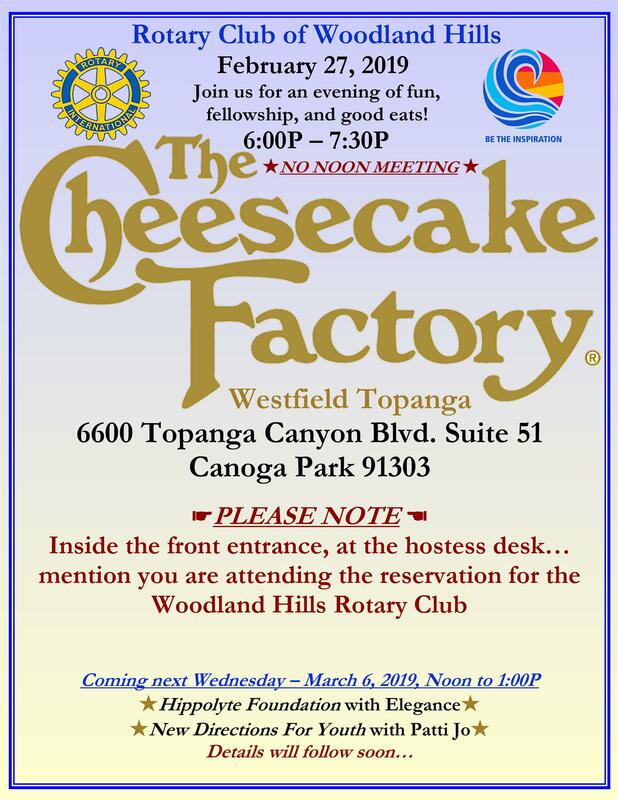 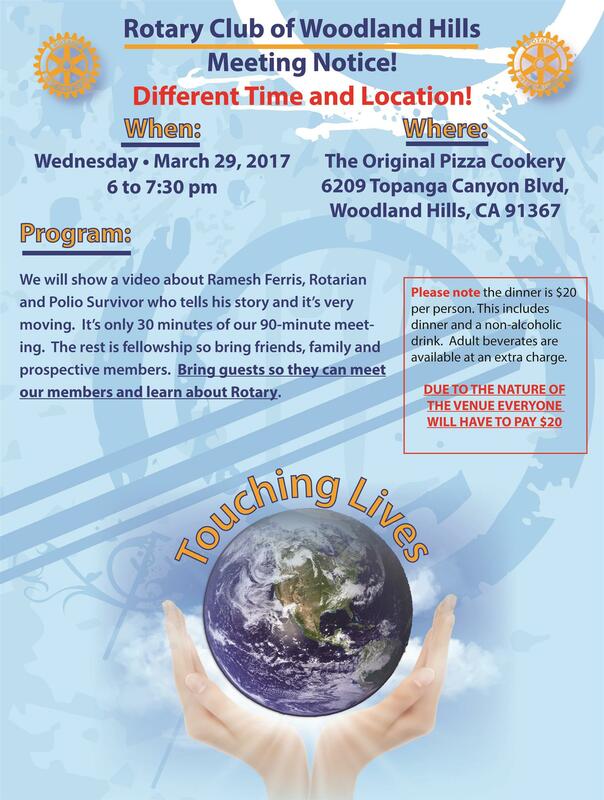 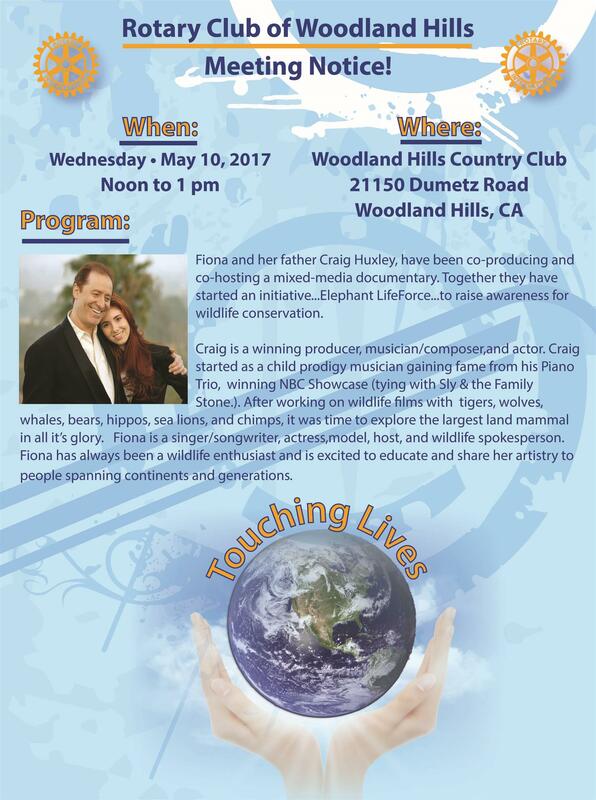 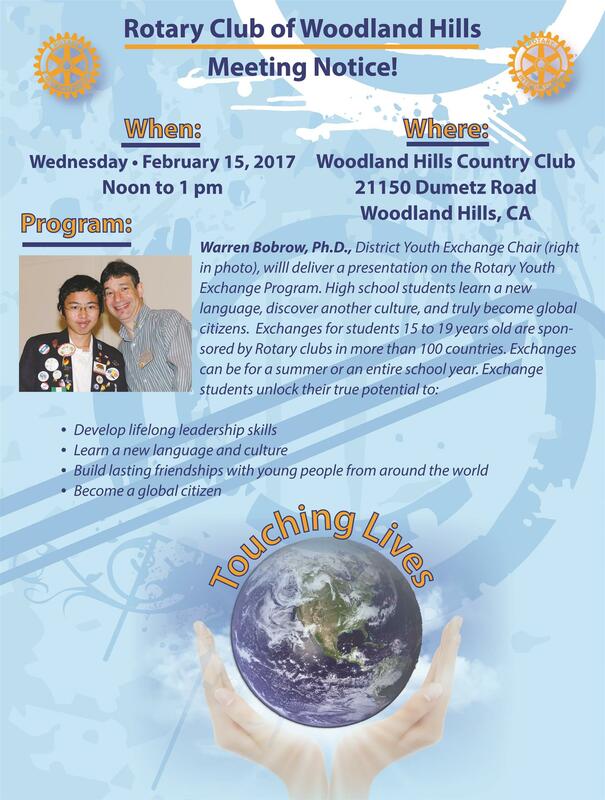 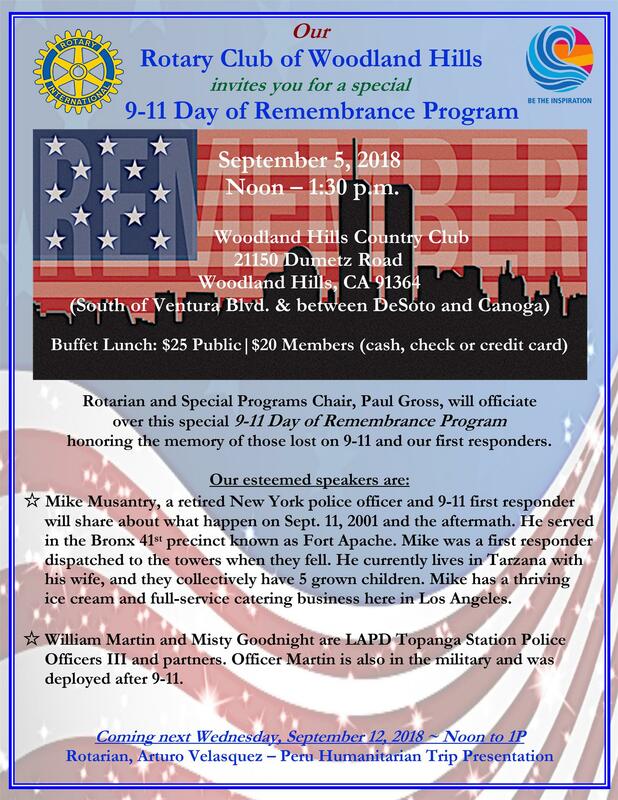 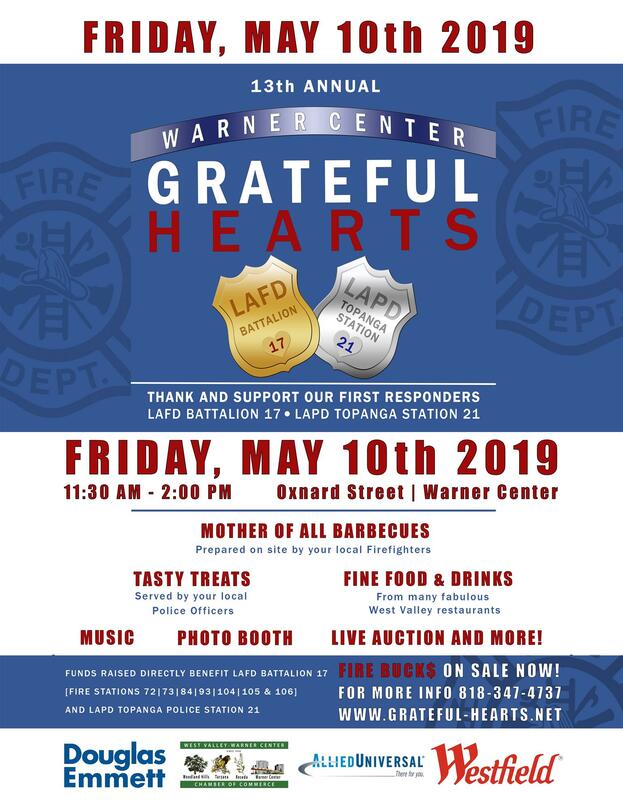 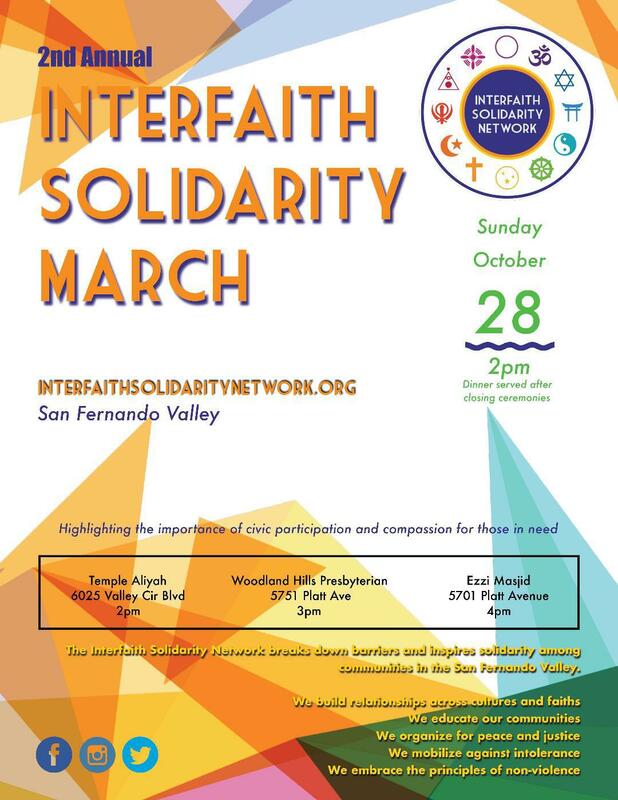 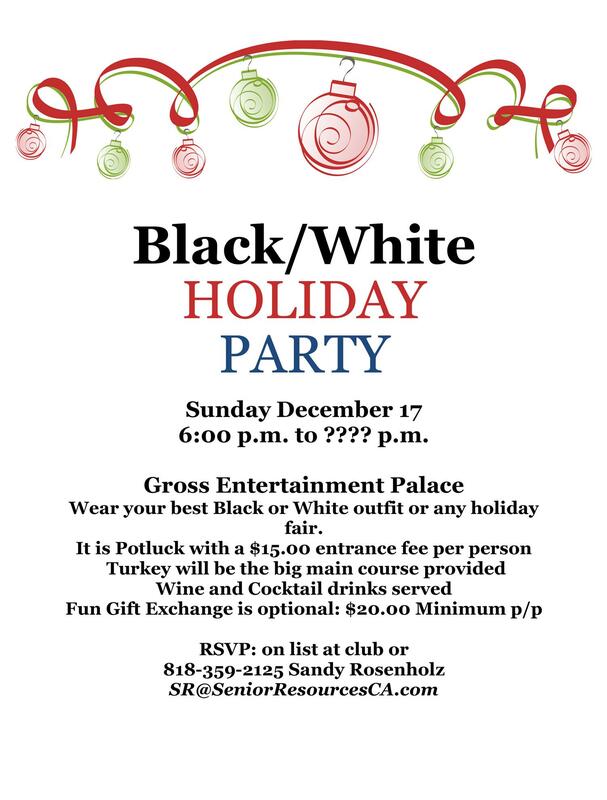 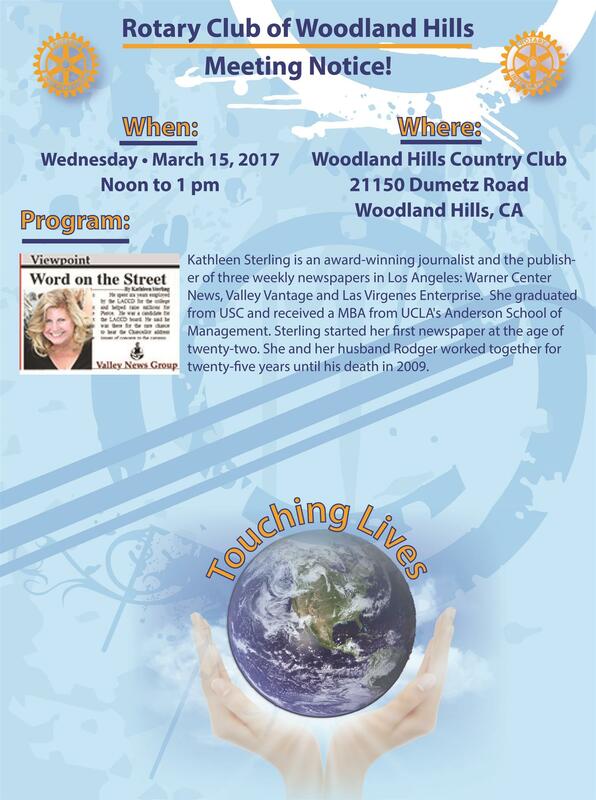 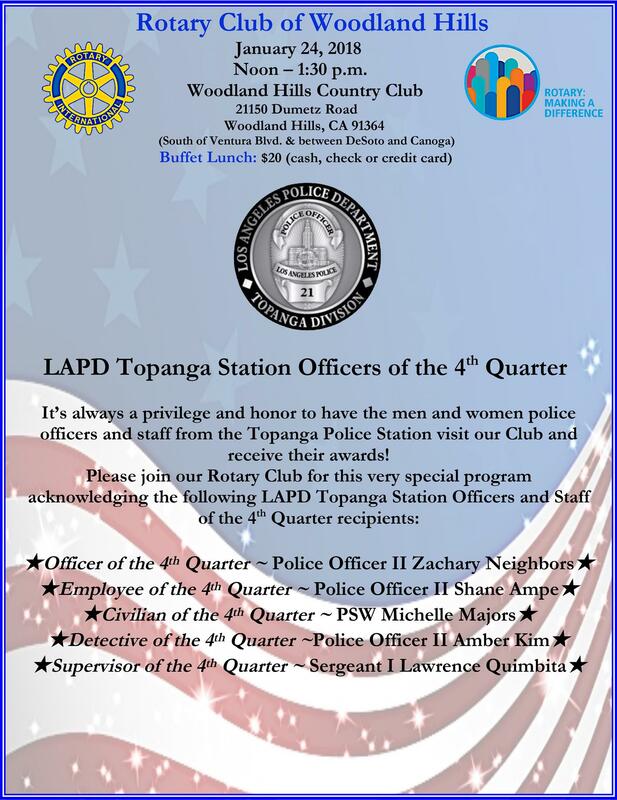 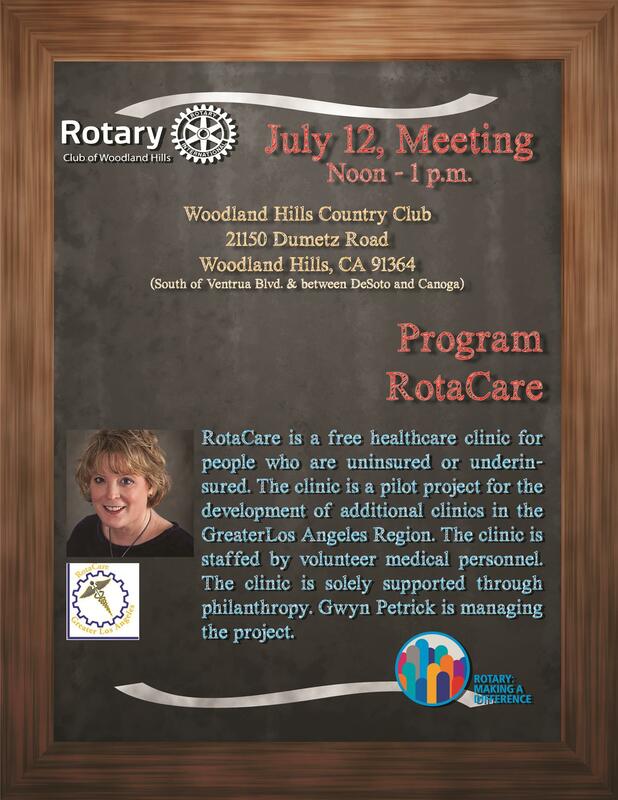 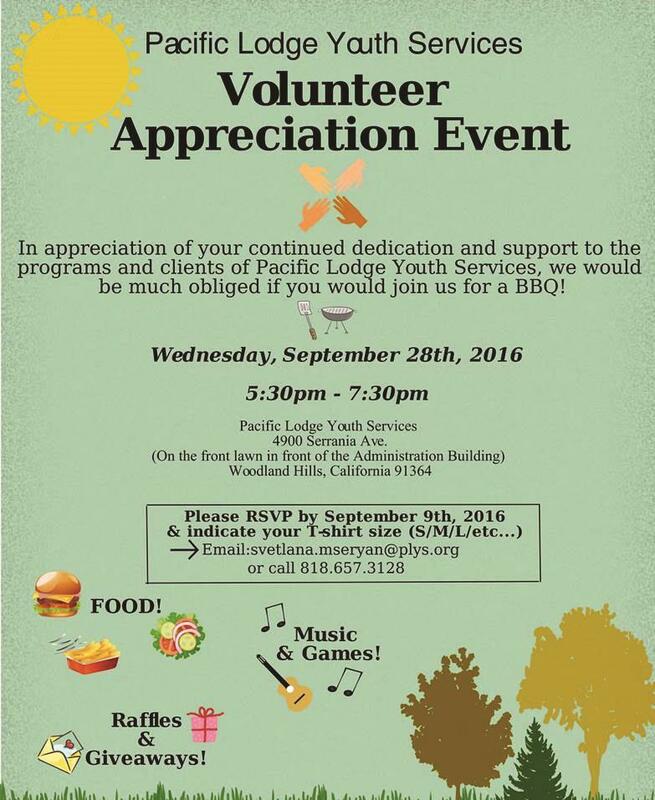 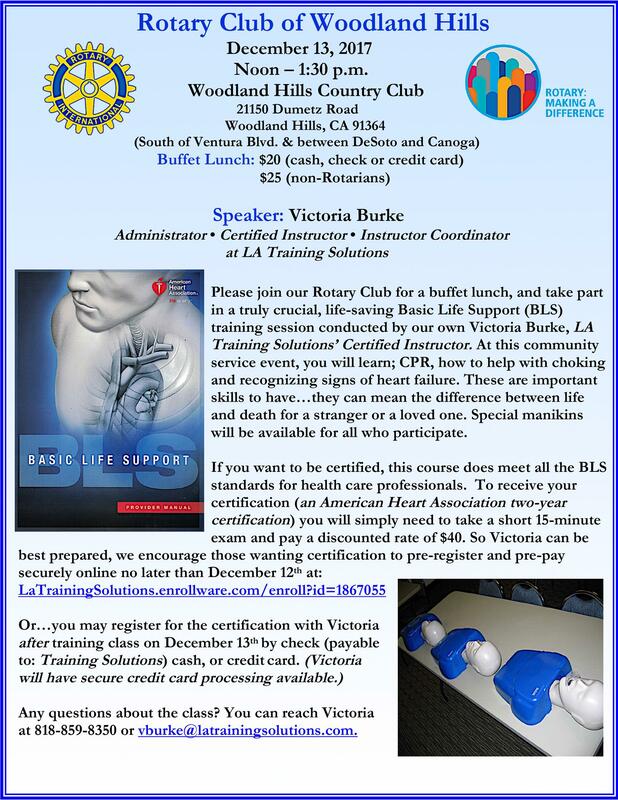 Note: To RSVP click on the Flyer or Call 818-402-9808 - This is an evening meeting. 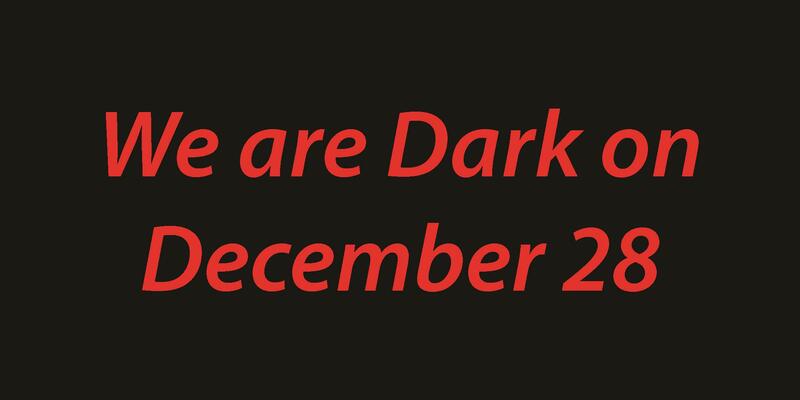 We will not meet at noon. Panel Discussion: Religion: A Pathway or Obstacle to Peace? 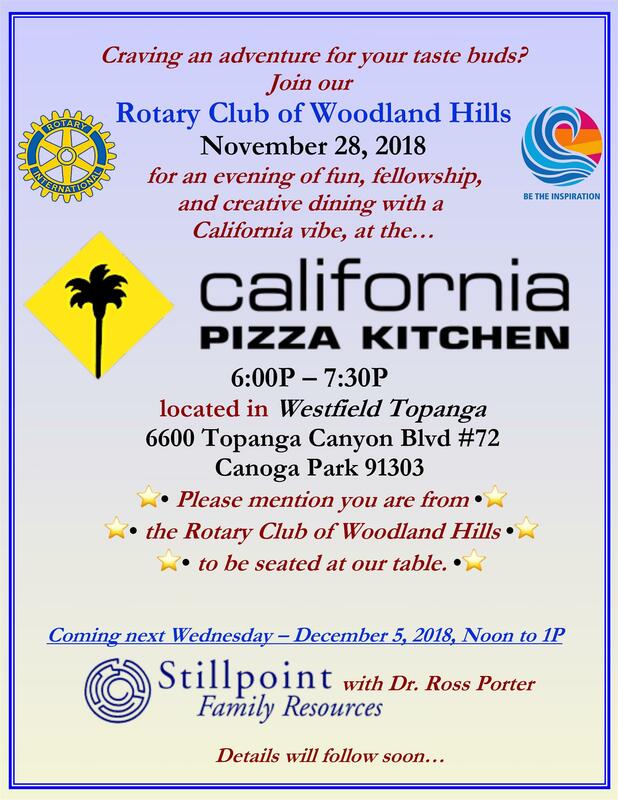 Posted by Michael Turner, M.S. 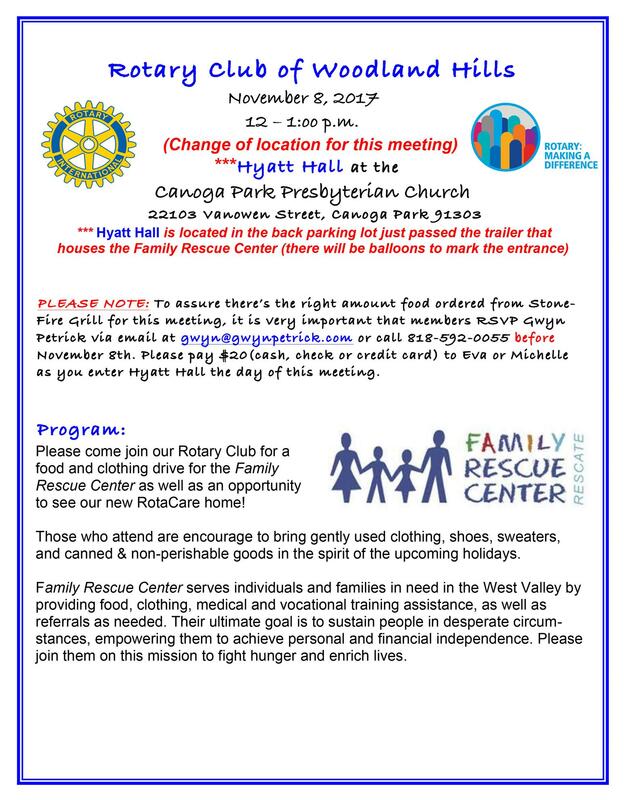 Blankets to Take Away the Chill! 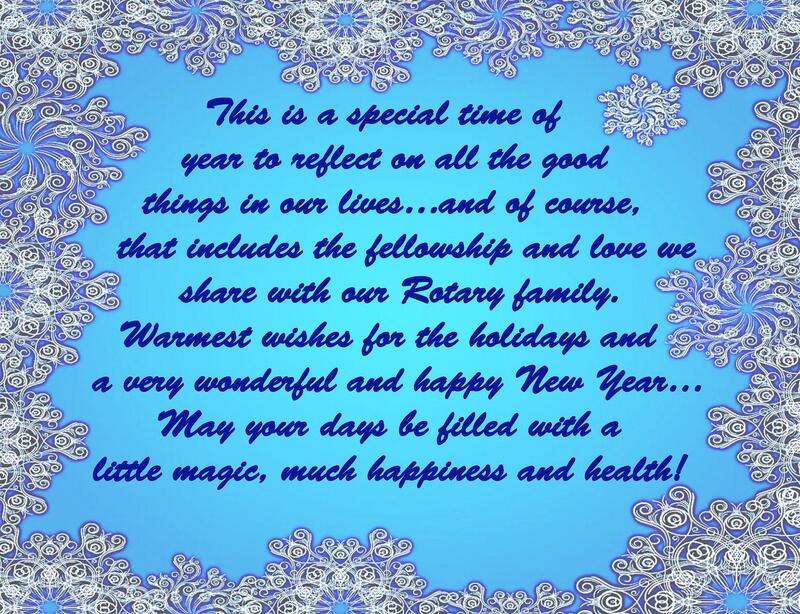 Quote of the Week - Who Said It?